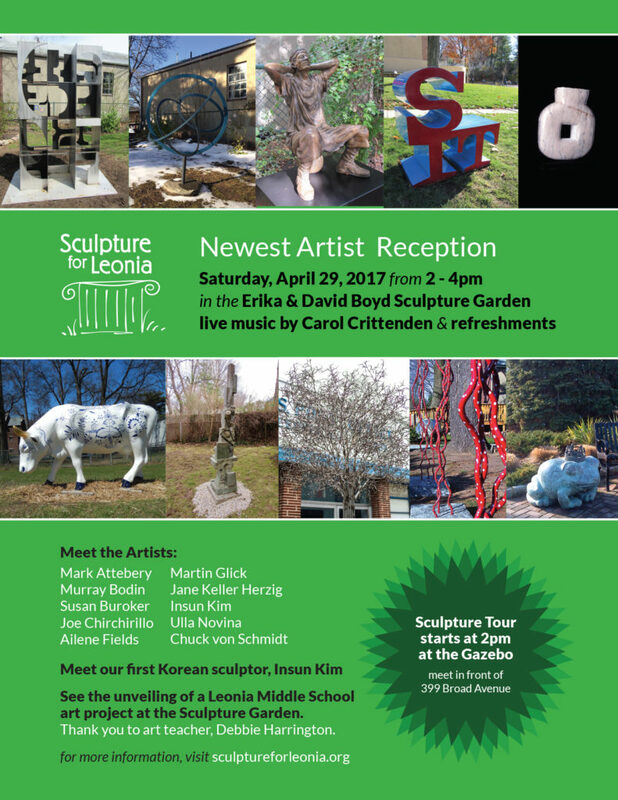 Please join us on April 28th 2018, International Sculpture Day, to celebrate and to meet the artists whose sculptures were installed in Leonia last year. There will be a bus tour to visit the sculptures around town and to hear the artists speak about their work. “Born in Louisville, Kentucky, I came to New York to work as assistant to the student advisor at International House. I received a B.A. Degree in political science at the University of Louisville. 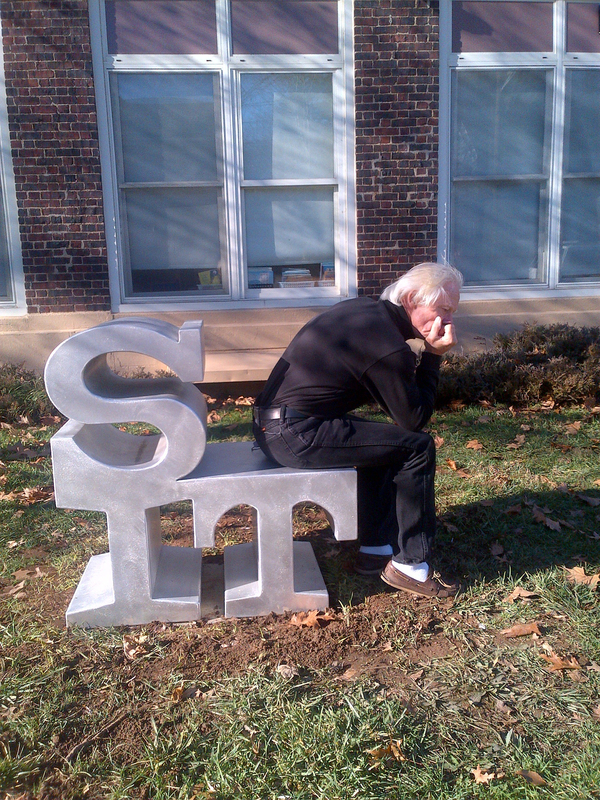 Dedicated to human rights issues as a Southerner, but equally seduced by the arts, I studied sculpture under Peter Agostini at Columbia University’s School of the Arts. I later received an M.A. Degree in Art Education from Columbia University Teachers’ College. “Creating art is a combination of incredibly intense and sublime moments, none of which you control. It’s my job to show up every day ready to work and while it can feel like slogging through deep mud with only a vague notion of the direction you are going – continuing to plod is necessary to end with a result that I would call art. It’s analogous to fishing… you do all the things you’re supposed to do, like get up really early, sit quietly on the river’s edge, watch the water’s surface and with a leap of faith – cast your line. Once you have done all this, it’s up to the gods whether you catch a fish or a tire. If you’re good at your sport, you may be able to ‘feel’ what you’re coming up with, hence the Daimones. But a large part of the process is ‘doing the work’ and taking a leap of faith. 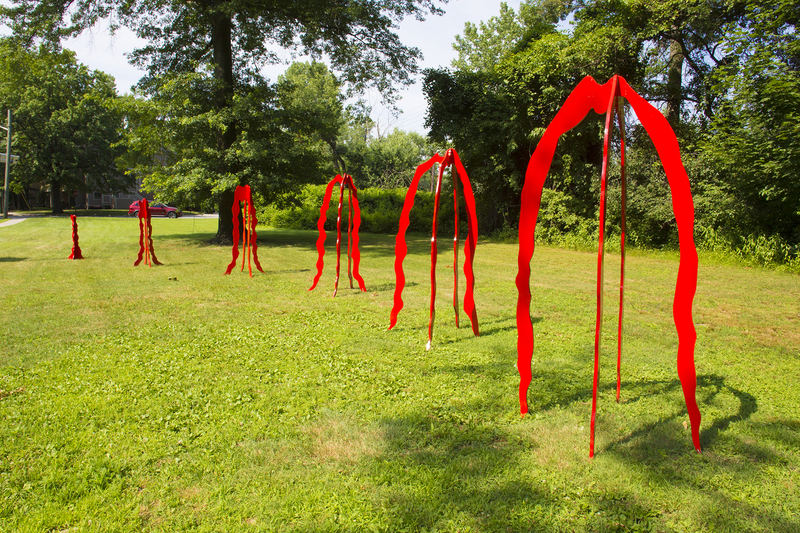 “Visually and conceptually, Color Field Sculpture® installations simultaneously present a dichotomy and an integration between the corporeal and the intangible – our physical and spiritual aspects. 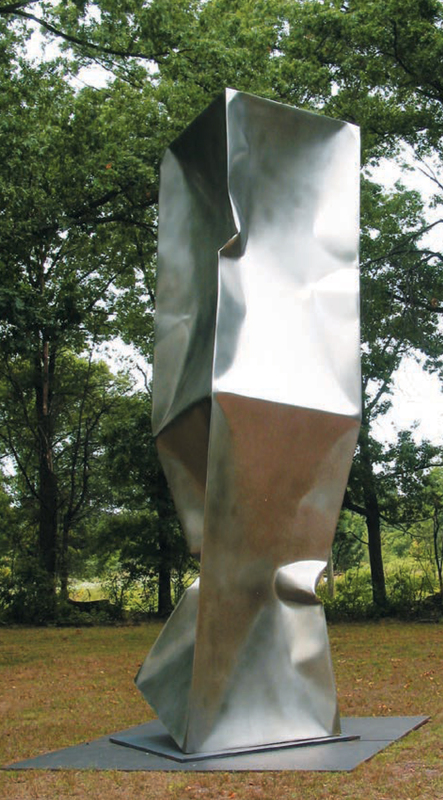 Monumental in size and visual impact, yet illusory, transparent layers play in the changing light to describe: material / immaterial, being / non – being, and the transitory nature of form. From miniature interior wall pieces to large-scale installations, Parriott’s concept begins with our passage through existence: “existence is the medium through which every aspect of being is transformed.” Overlapping layers of experience translate into sheer sculptural layers that interact with each other, the participant, and the environment. 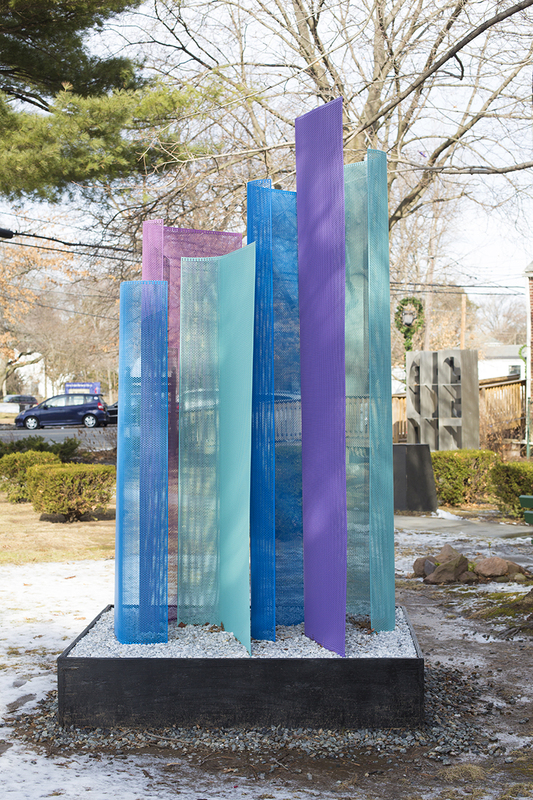 Largest scale site-specific configurations invite viewers to enter into and move through the sculpture – transitioning through time, space, prismatic patterns of color, blended tints, and optical illusions. We question our conditioned perceptions and what seems to be, changes. 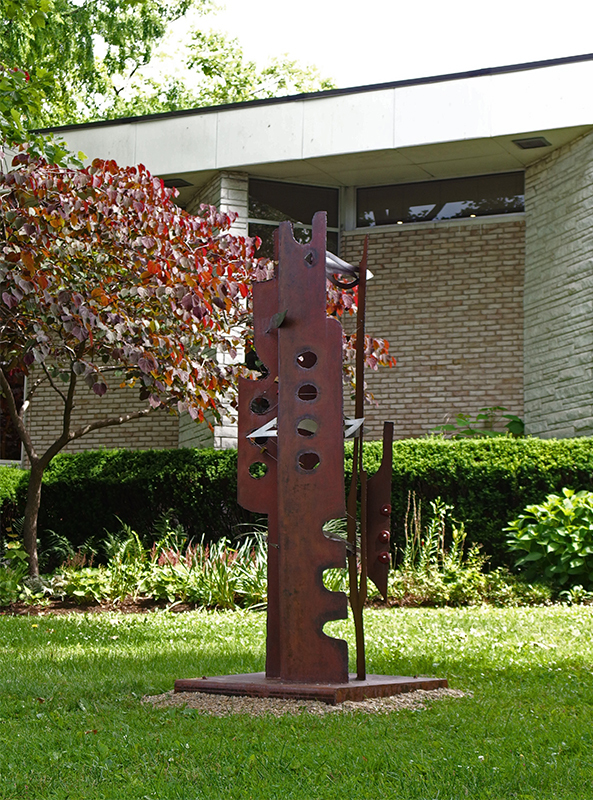 Perforated heavy gauge aluminum is rolled, bent or folded by powerful presses as the sculptural concept emerges. 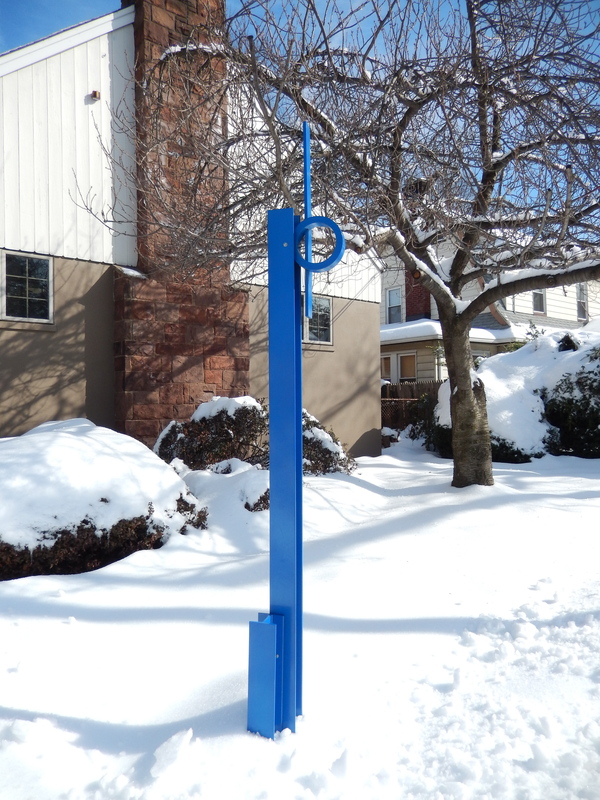 Permanent powder coated color is electrostatically applied to all components. In a process of welding the artist’s vision to technical necessities, industrial materials are transformed from ordinary “workaday” existence into lyrical multi-dimensional expanses that immerse the viewer in vibrant fields of color. 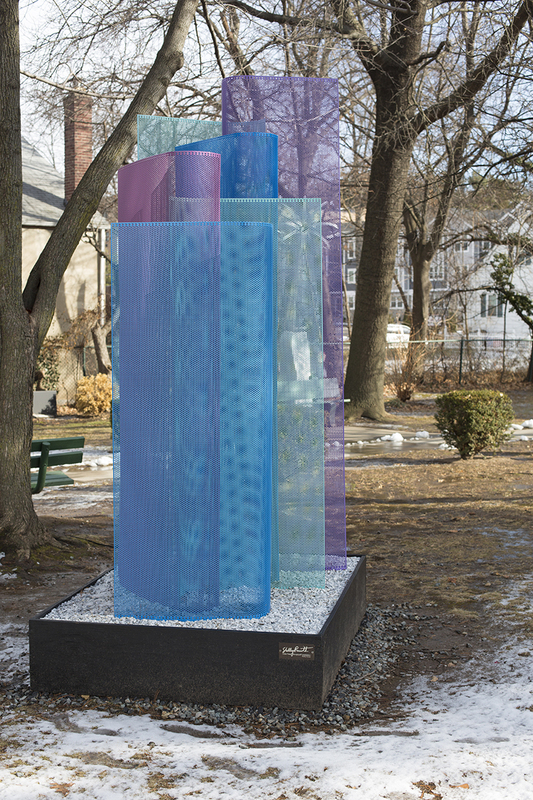 As light passes through the transparency of the sculpture, the atmosphere shifts; shapes that at first glance appear to be solid and corporeal now elude definition. 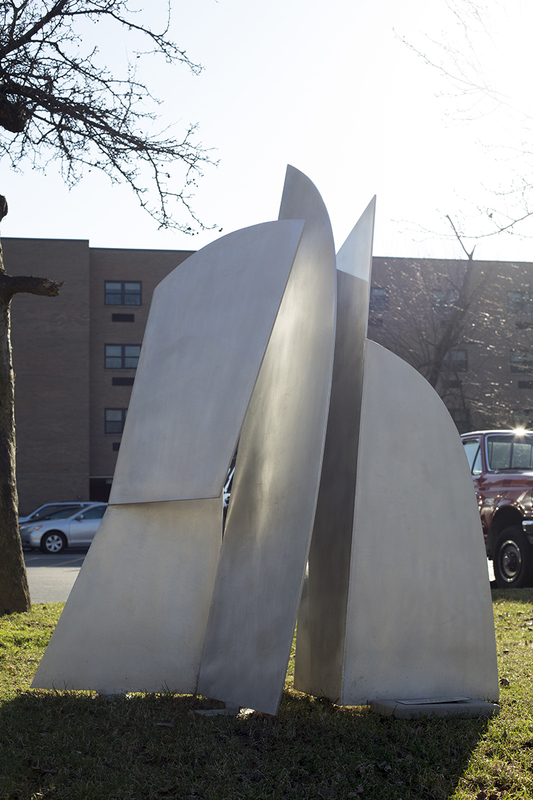 Mysterious shimmering nuances seem to appear/disappear, and take on an airy quality not usually associated with structurally sound large-scale sculpture. 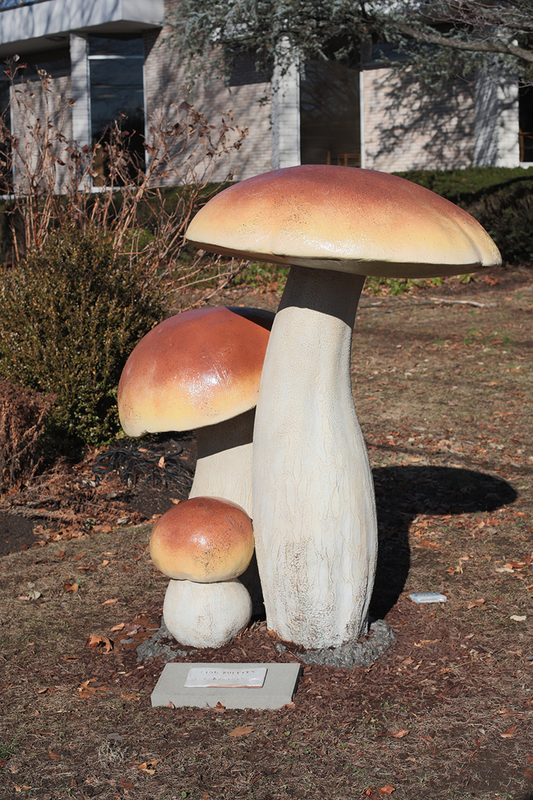 Large scale group of mushrooms, foam coated with fiberglass. 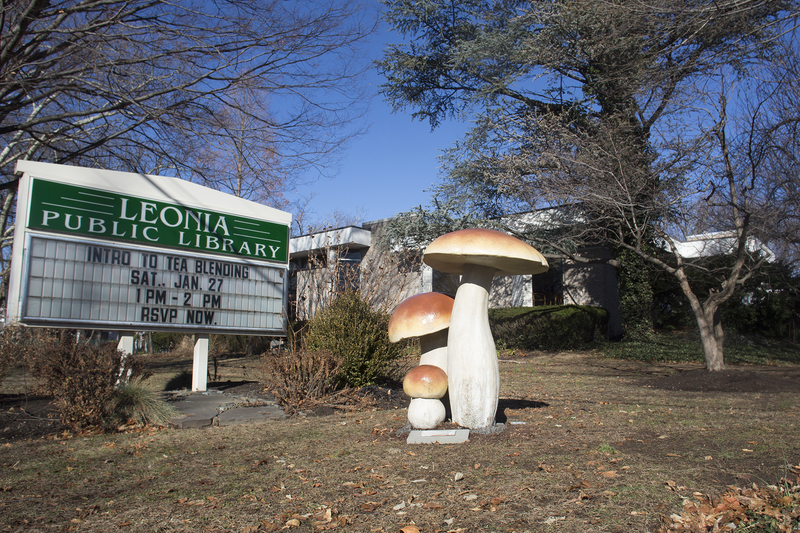 Installed on the front lawn of the Leonia Library. More information coming soon. 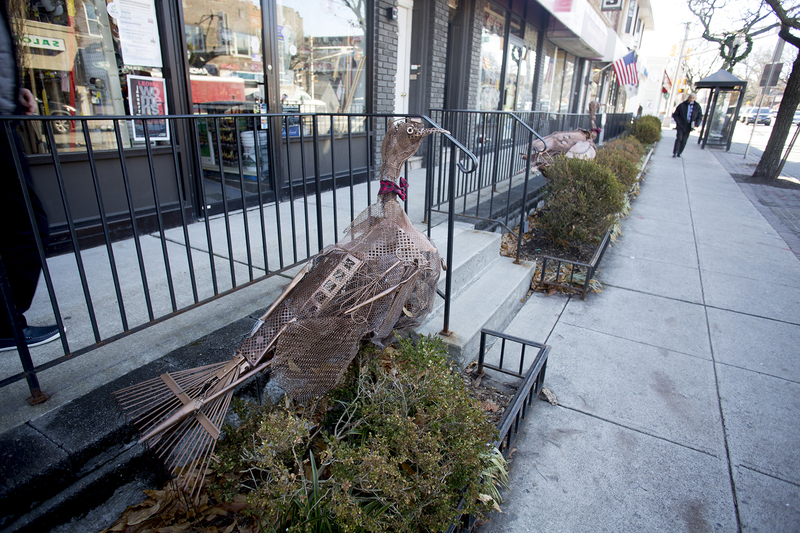 Two life-sized turkeys made of found metal objects. 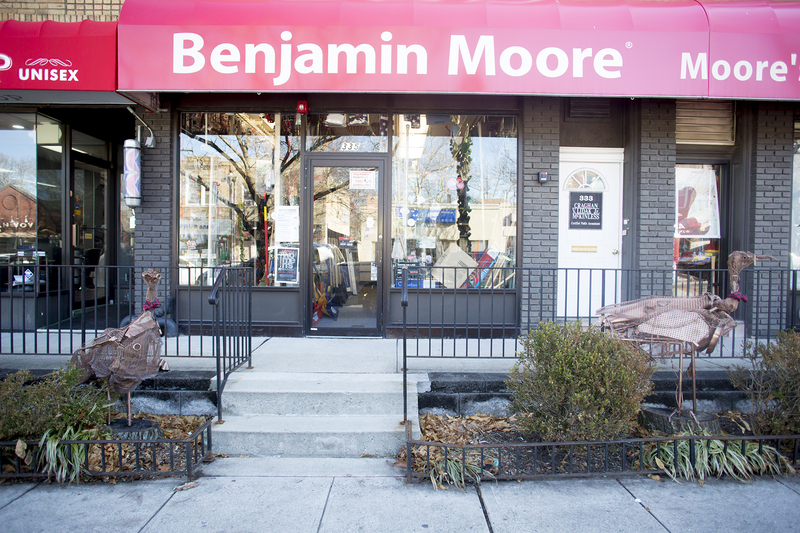 Installed in front of Moore’s Hardware on Broad Avenue. “Especially when the environment is under bombardment, I feel strongly about sending a message through my art. 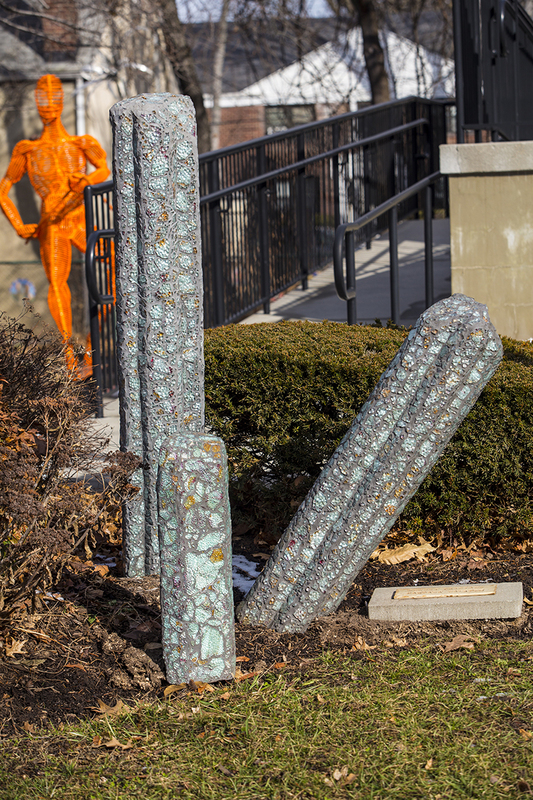 For the 2017 Beacon 3D exhibition I have created a “snowflake cactus”, a large ferro-cement sculpture. 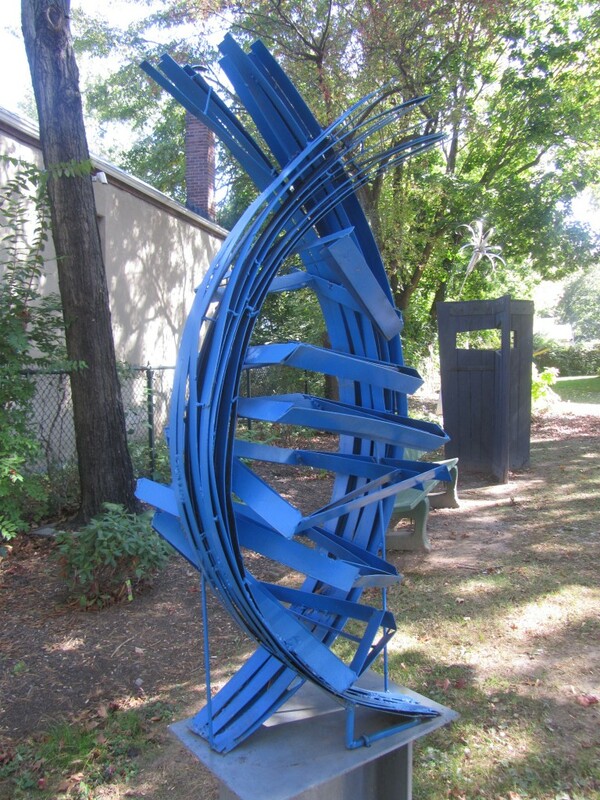 It is mounted on a steel base and has three sections standing 8.5 feet high and 3 feet wide and long. 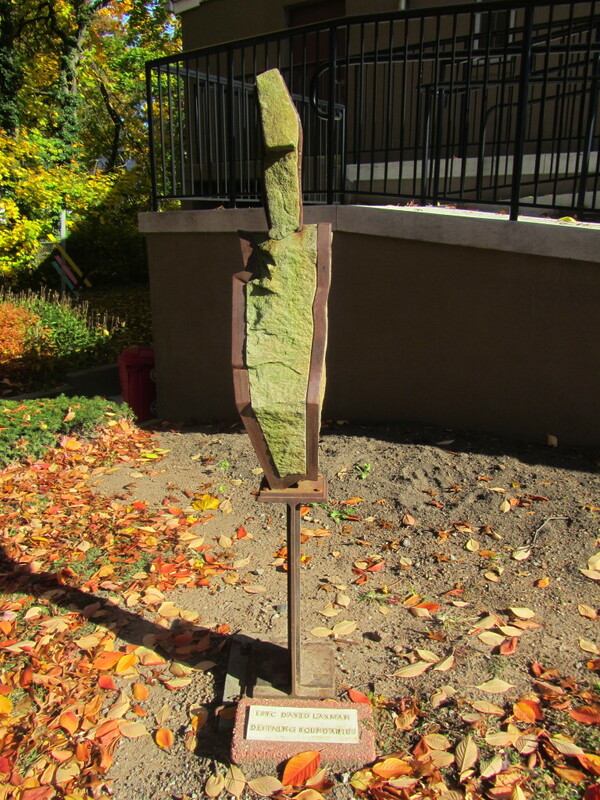 The sculpture has embedded copper wire on its edges and is painted with ornamental cement stains, paints and sealer. 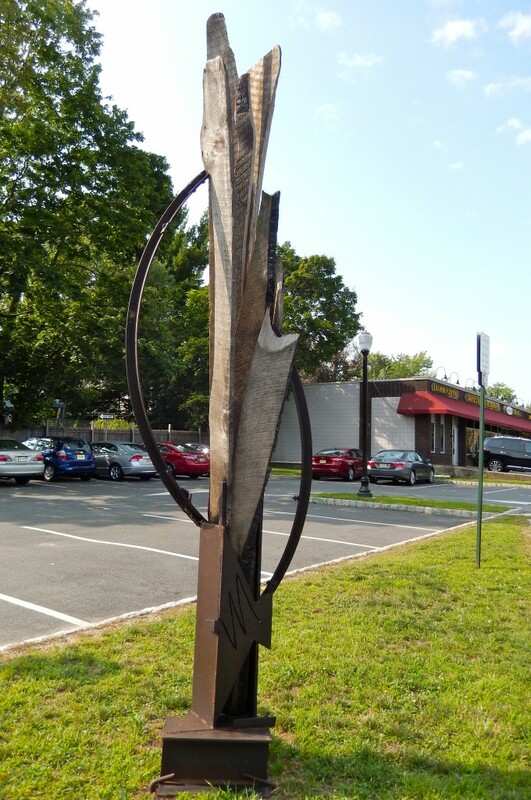 R. Douglass Rice, who has had studios in New York City and Stonington, Connecticut, has exhibited in the National Arts Club in New York, Mystic Museum of Art, Farrah Damji Galleries in New York and East Hampton, Beef Gallery in San Francisco, Avondale Arts Center in Avondale, RI, and others. He studied at Stanford University, from which he graduated with a BA, the Mendocino Arts Center, and the School of Visual Arts in New York City. 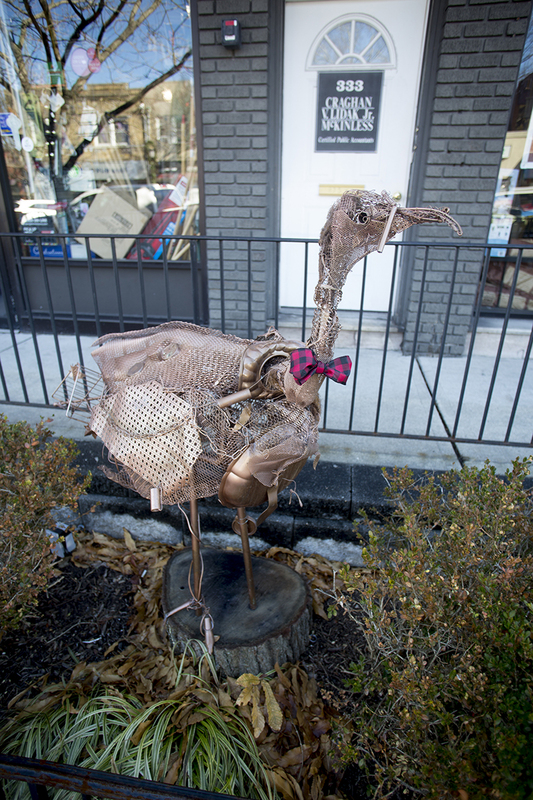 He currently lives in Stonington, CT.
“I salvage scrap materials and obsolete objects, repurposing and recomposing them as works of art, while combining previously unrelated elements in unusual and unexpected ways. 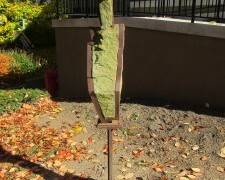 My sculptures evoke the former times, places, lives, unique character, and embedded energy of their source materials. I tell their stories, as I explore and mediate the essential relationship between their form and content. Ulla Novina was born and educated in Sweden and studied sculpture in the studio of Minoru Niizuma. 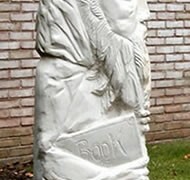 In addition to creating art, she also lectures on art and sculpture. 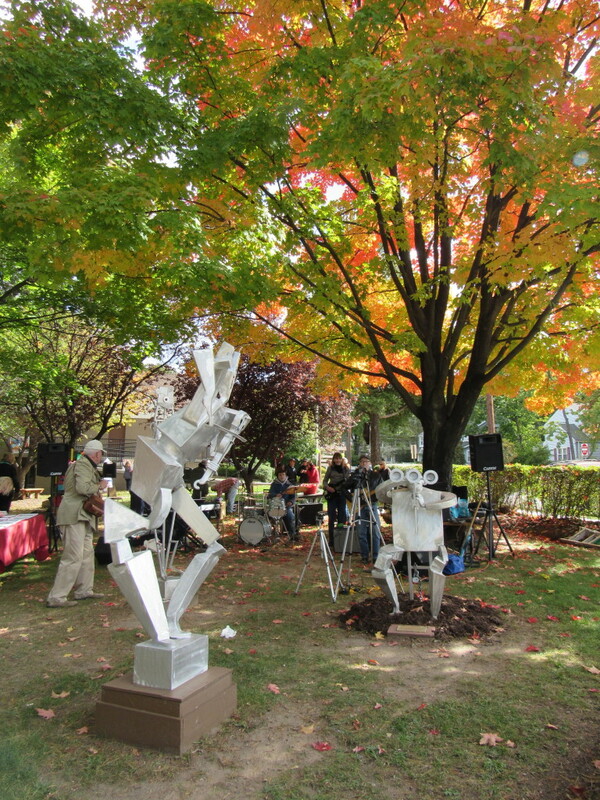 She is a former board member of the Art Center of Northern New Jersey, and the president of the Art Center Sculptor Affiliates. Novina is represented by Broadfoot & Broadfoot Gallery of Fine Art in Boonton, NJ and the Lower East Side of Manhattan. 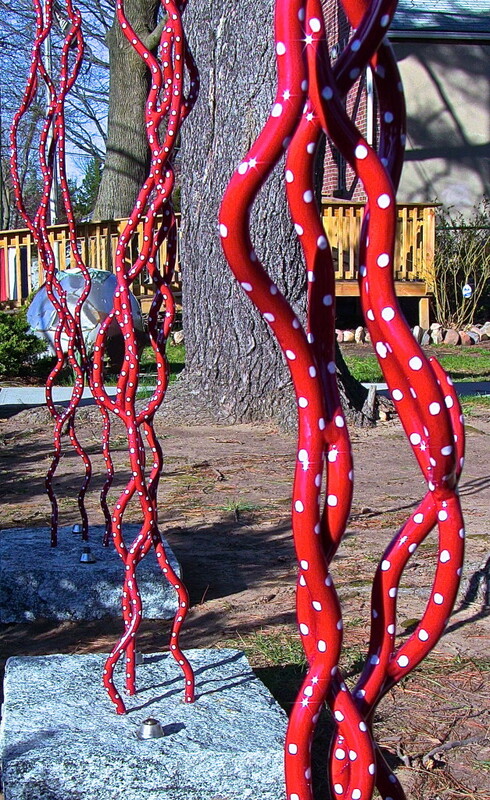 Her sculptures are in many private collections in both the USA and Sweden. 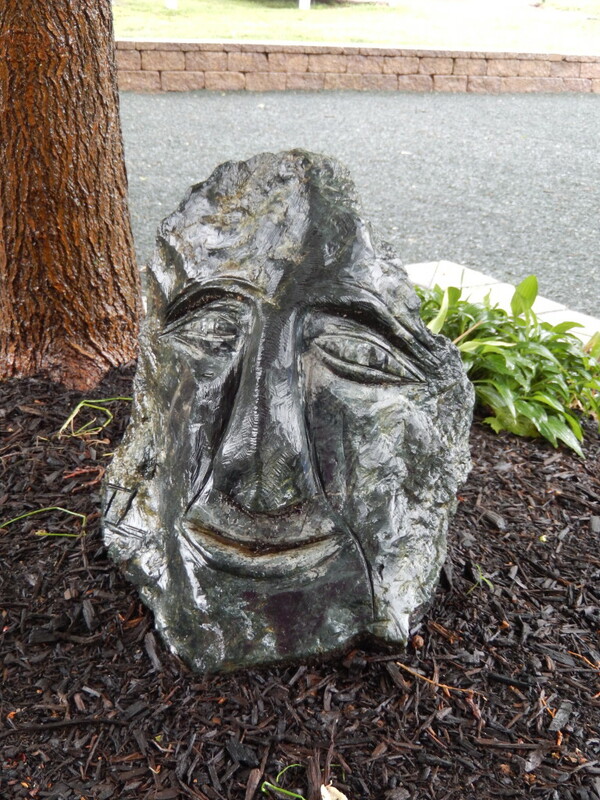 Novina writes: “My sculptures are expressions of my love of and my identification with the stone. 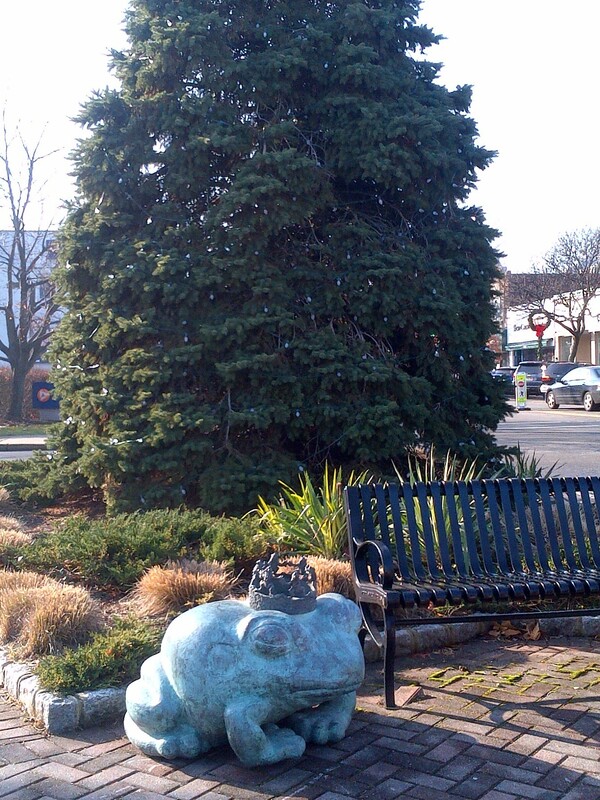 Ancient Vessel is installed inside Leonia’s Borough Hall. 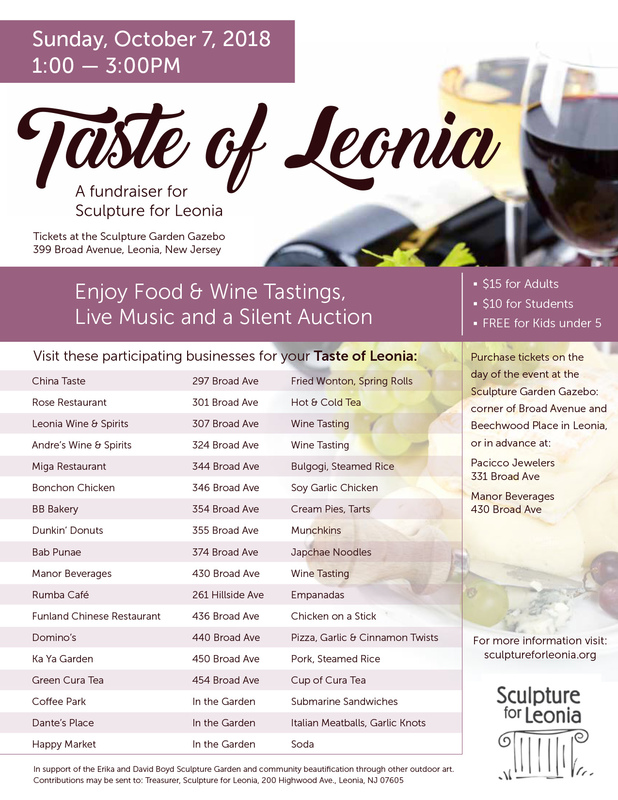 Ancient Vessel has been generously donated to the Borough of Leonia. 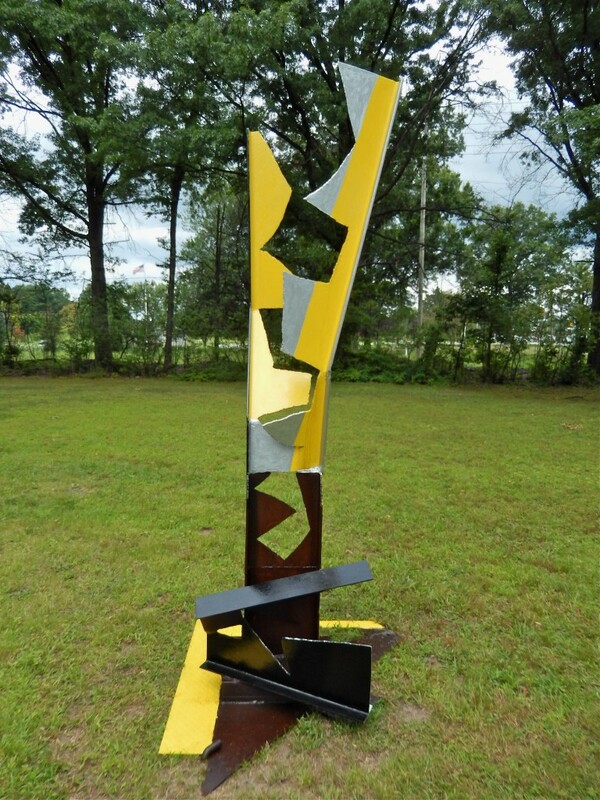 Charles Palminteri is a bold, abstract painter of the “action” school. Many of his works are purchased by architects for office buildings and executive homes in New Jersey, New York, Connecticut and Florida. 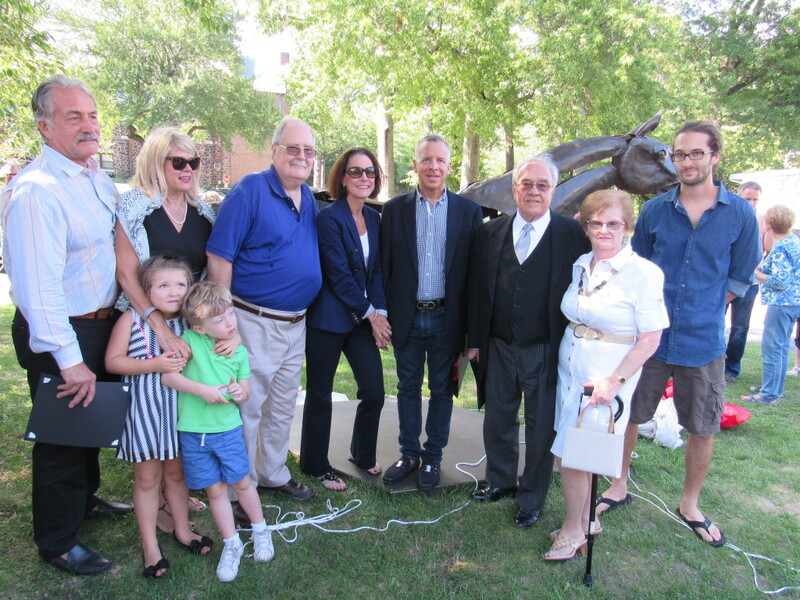 Mr. Palminteri has exhibited at Foote Cone & Belding in Manhattan, rocheBobois in Estero, Florida, the Sweet Art Gallery in Naples, Florida, the Speak Easy Gallery in Boonton, New Jersey, and the George Segal Gallery at Montclair State University. Palminteri uses a variety of styles and approaches in an abstract expressionist framework. 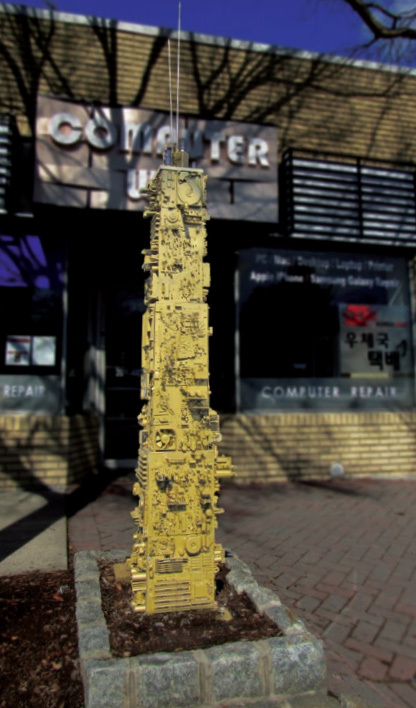 Some are large, gold patterns and shapes developed from Japanese Kanji and Hiragana calligraphy. The start contrast of these shapes in their background sets up a tension between the negative and positive areas that demand attention from the viewer. In other works, Palminteri’s lines are soft and flowing. With a series of undercoatings, he achieves a luminosity of color and light. His shapes lead the viewer into a maze of dreams and lunacy. No matter how soft the lines and shapes, the overall message is strong and clear. A graduate of the School of Visual Arts, Palminteri attended the Arts Students League and the Chinese School of Brushwork in New York City. Mr. Palminteri is also a well-known commercial artist and graphic designer whose clients include many Fortune 500 companies. For more information, please visit insunkim.com. 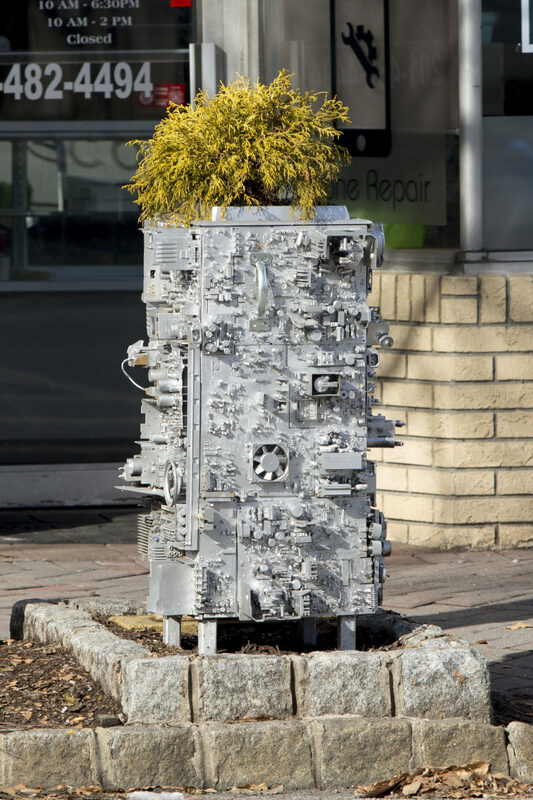 “Over the last 5 years I have been concerned with creating sculpture that is drawn from elements found in nature, architecture and mechanical world. Sometimes they strike me as parts of decaying buildings, other times as architectural order emerging from nature. There is an intentional vagueness about the visual imagery. For me, sculpture is about creating what doesn’t exist as opposed to rendering what does. 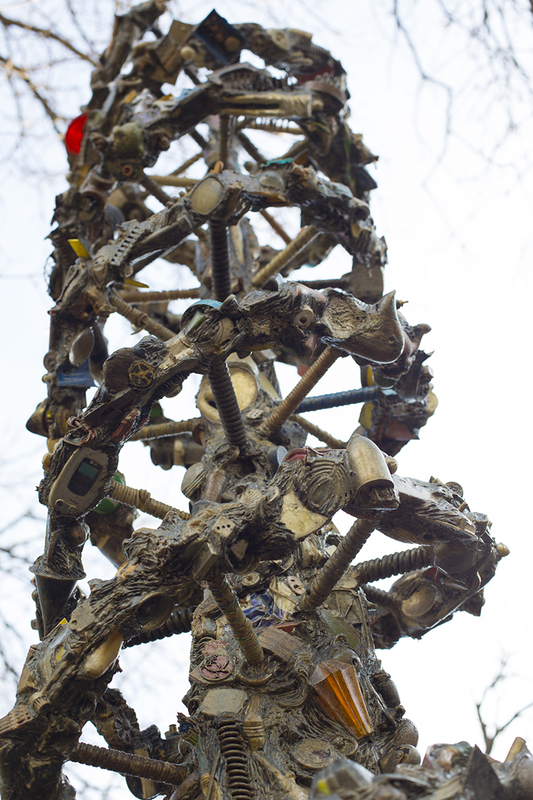 It is a conglomerate object created by someone who is having a conversation with the material and the world around them. 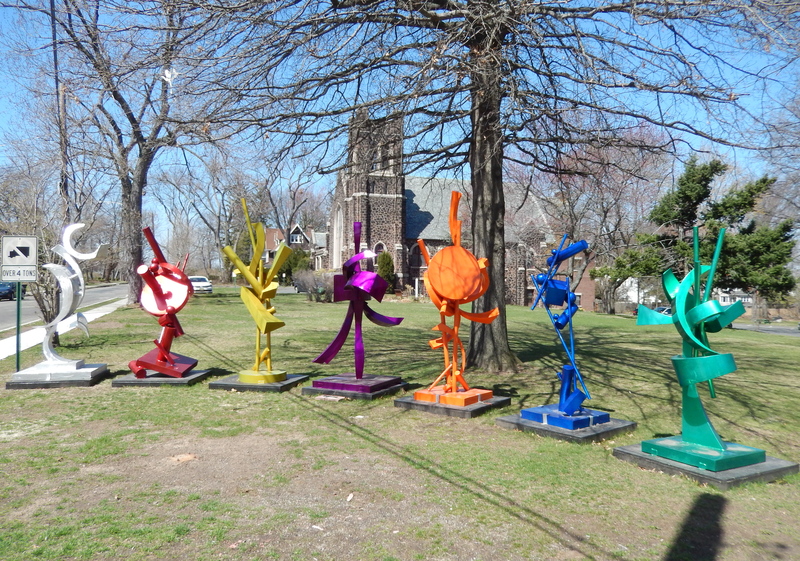 These sculptures are located on the corner off Fort Lee road and Station Parkway. 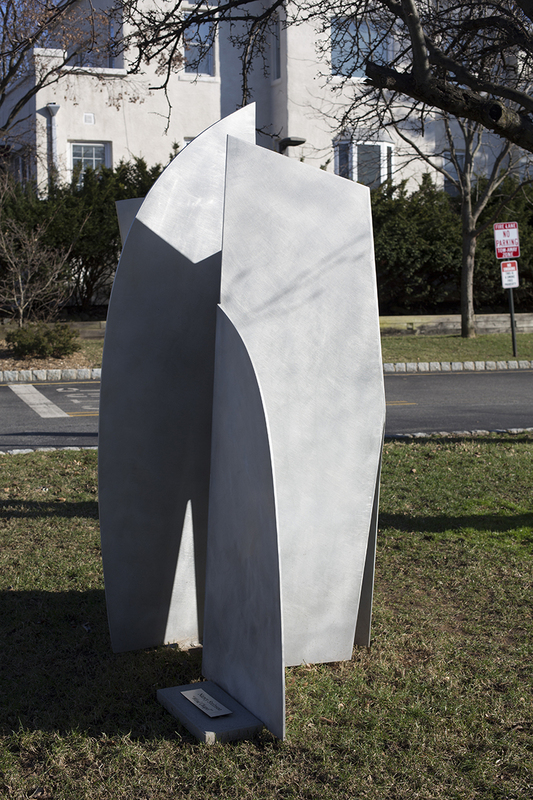 Ewerdt Hilgemann, distinguished Amsterdam-based German artist is currently showing in Leonia, N.J. 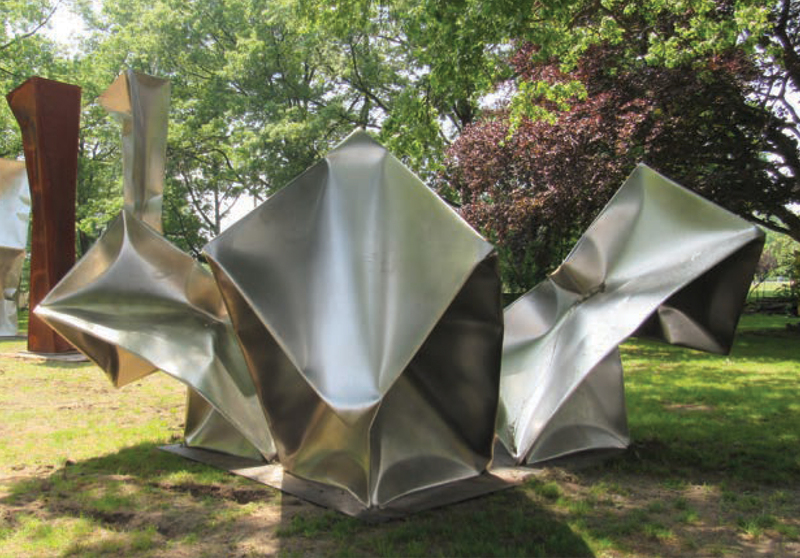 The sculptures, ranging in size from 8 to 20 feet in height, were created specially for a Park Avenue, New York City installation using a unique vacuum process, which “implodes” geometric shapes causing the material to deform according to natural laws. Hilgemann developed his method in the early 1980s after experimenting with white wooden wall pieces that captured light, influenced by ZERO movement. 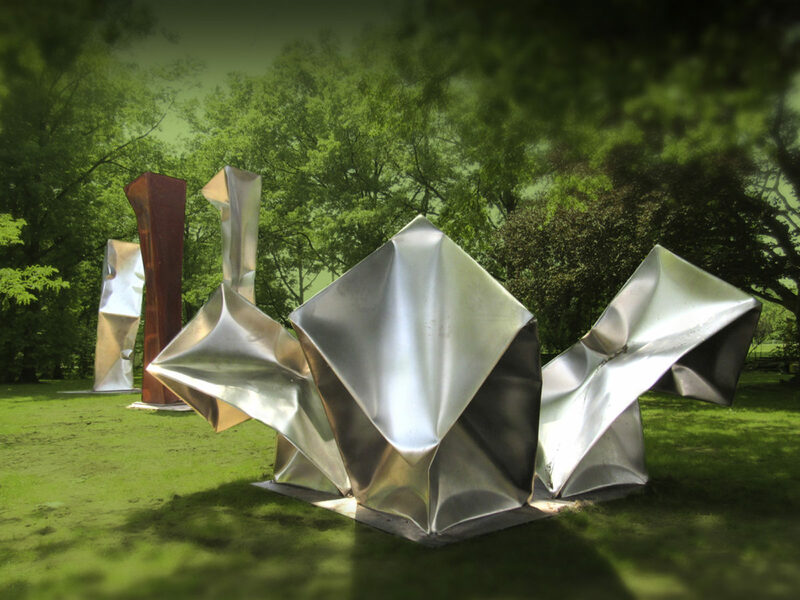 Hilgemann’s “implosion” process begins by fabricating perfect, geometrically pure stainless steel forms, which are meticulously welded and polished to satin gloss. After this part of the process is complete, the artist slowly pulls the air out with a vacuum pump, putting the natural atmospheric pressure to sculptural use and collapsing the forms into their final shape. In a delicate balance of planning and chance each piece acquires individual character demonstrating unexpected and striking possibilities of the material. 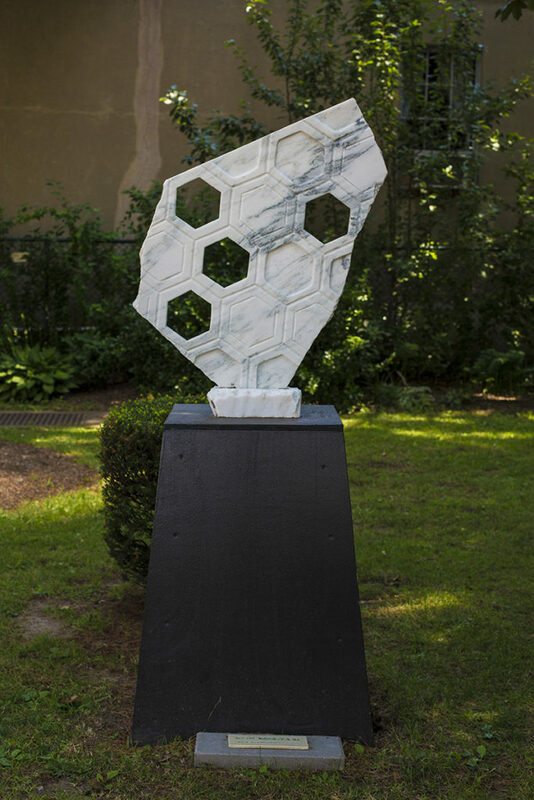 “To me the implosion represents the inward spiral of energy to reach the core and mystery of matter, the ultimate beauty of creation,” says Hilgemann. Ewerdt Hilgemann (1938) was born in Witten, Germany and after briefly studying at the Westfälische Wilhelms-University in Münster, he attended Werkkunstschule and the University of Saarland in Saarbrücken. 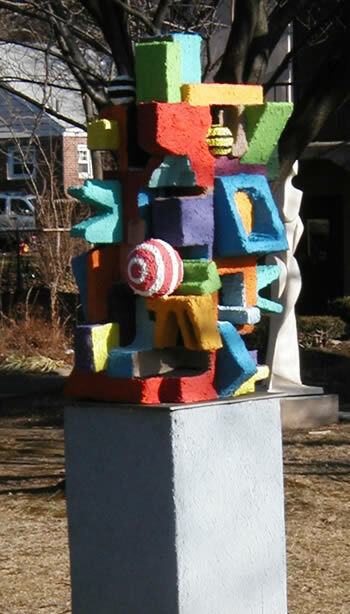 In the 1960’s he had residencies at Kätelhöhn Printers in Wamel, Asterstein in Koblenz and Halfmannshof in Gelsenkirchen, Western Germany, and started to exhibit his work across Europe before moving to Gorinchem, The Netherlands; and has had public installations from Busan, Korea to the City of West Hollywood, CA. Since 1984 the artist lives and works in Amsterdam. 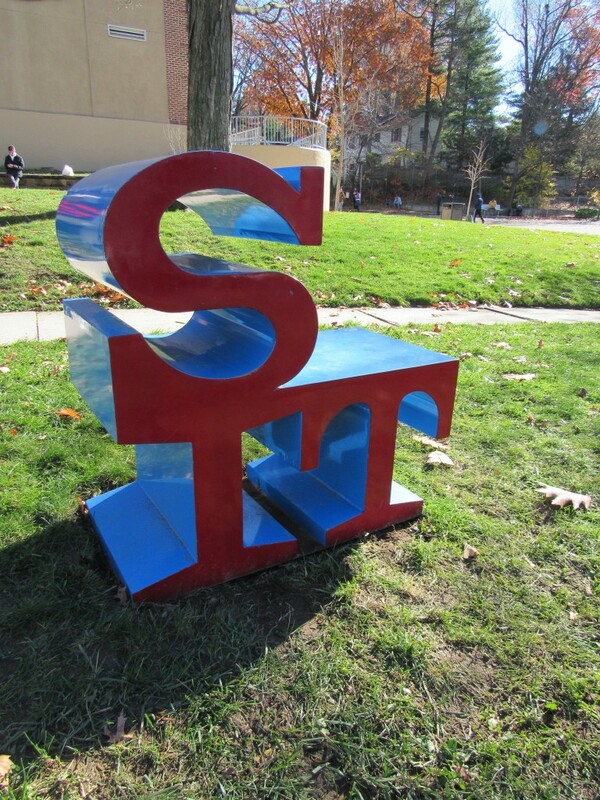 This sculpture is located in the sculpture garden. 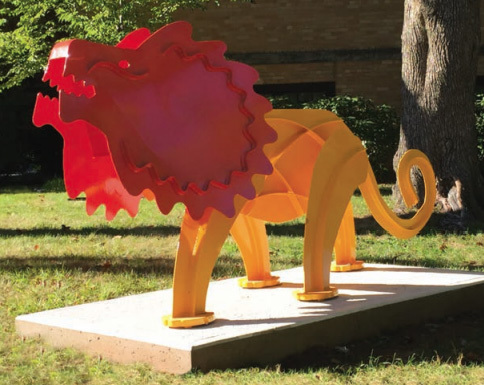 Metal sculptor and multi-media artist Mark Attebery worked previously in stained glass, with over one hundred glass works installed throughout California. 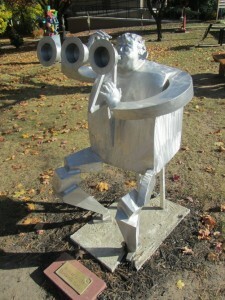 In addition to visual arts he’s had a busy career as a composer. He has received numerous music commissions from dance companies, including the Oakland Ballet & Malashock Dance Co. Mark received awards from the San Diego Arts Commission, the Ann & Gordon Getty Foundation and Meet the Composer Inc. The American Ceramic Society included Mark’s recordings of experimental clay musical instruments in a CD & Book titled From Mud to Music. He teaches at Ethical Culture Fieldston School in New York. 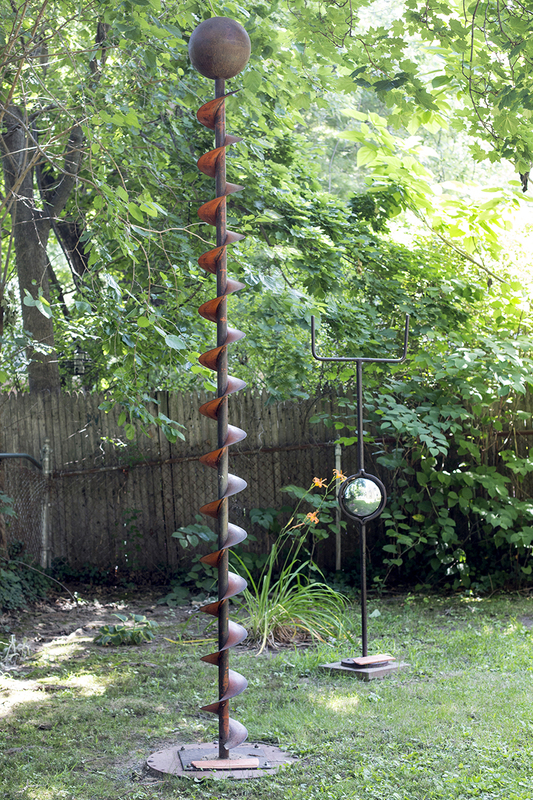 Mark fabricates his forged and welded steel sculptures in his Nyack, New York studio. His work is exhibited throughout the United States. 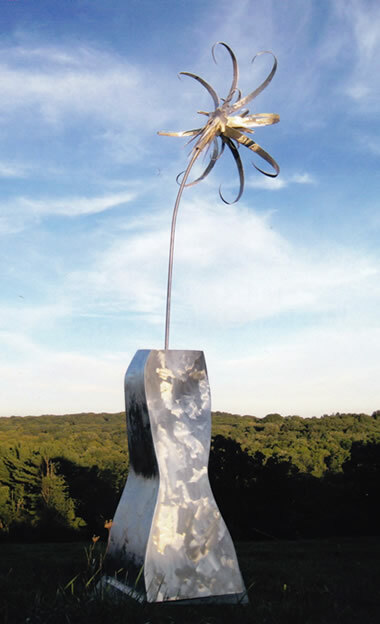 Artist Statement: As a sculptor I’m interested in depicting beauty, stillness and most of all a life energy coursing through metal. 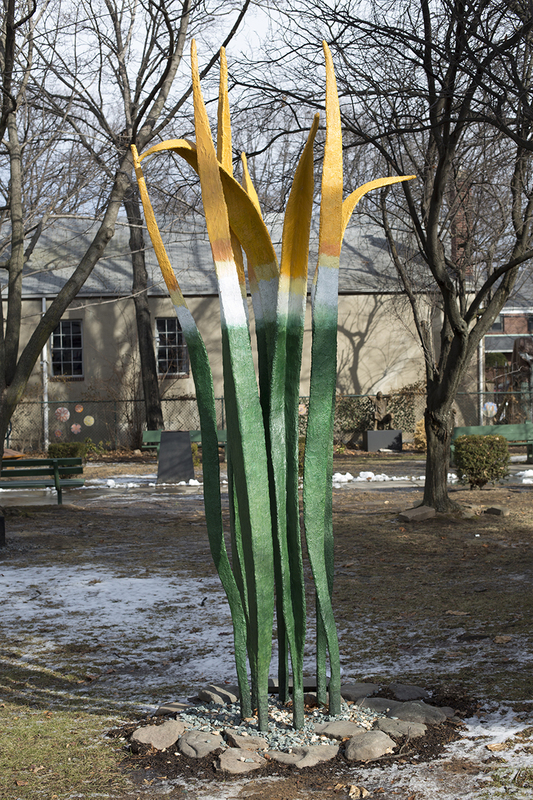 Flowing movement and sensuous growth observed in nature inspire recent sculptural work. 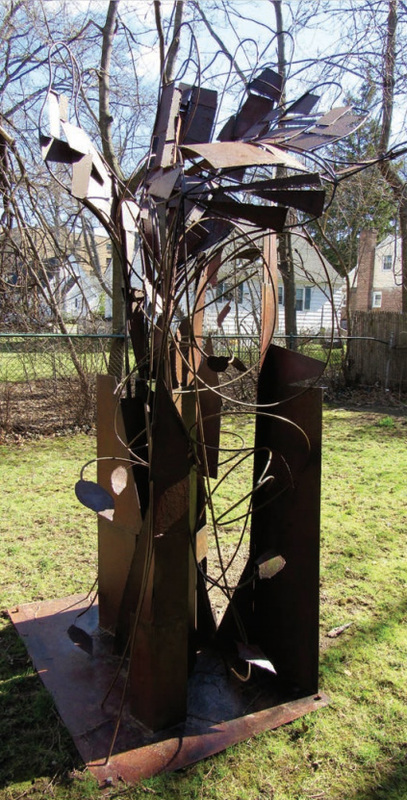 While primarily abstract, these steel sculptures suggest natural phenomena and living organisms inspired by both botany and astronomy. 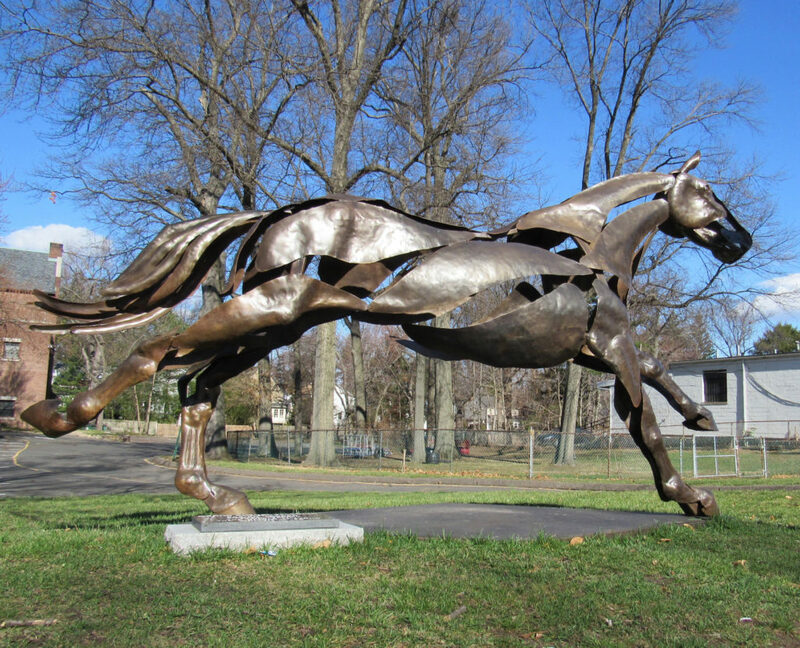 Graceful gestures are forged using traditional blacksmithing, then welded and finished with patinas, electro-plating, automotive paint or powder coating. These are personal choreographic gestures in metal, aiming to capture moments of elemental grace observed in the natural world. 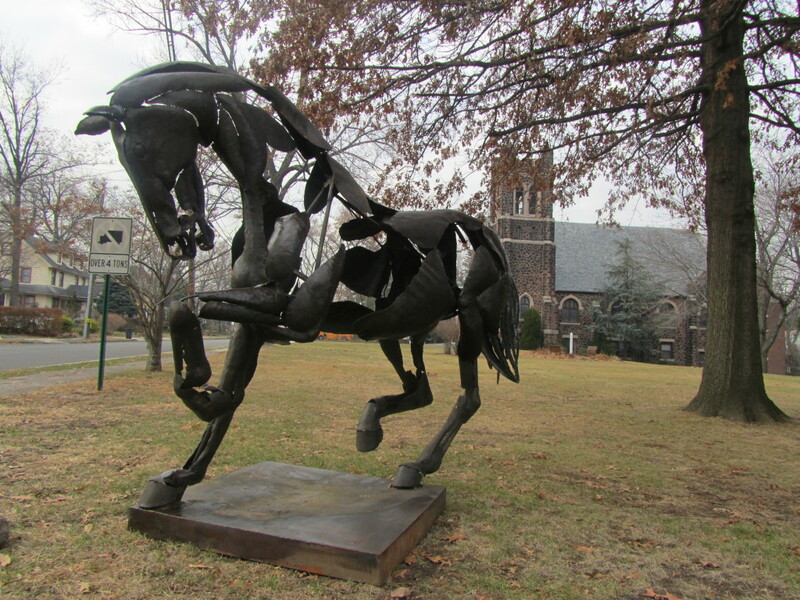 The horse is now located on the Methodist church lawn on Broad Ave. across from the sculpture garden. 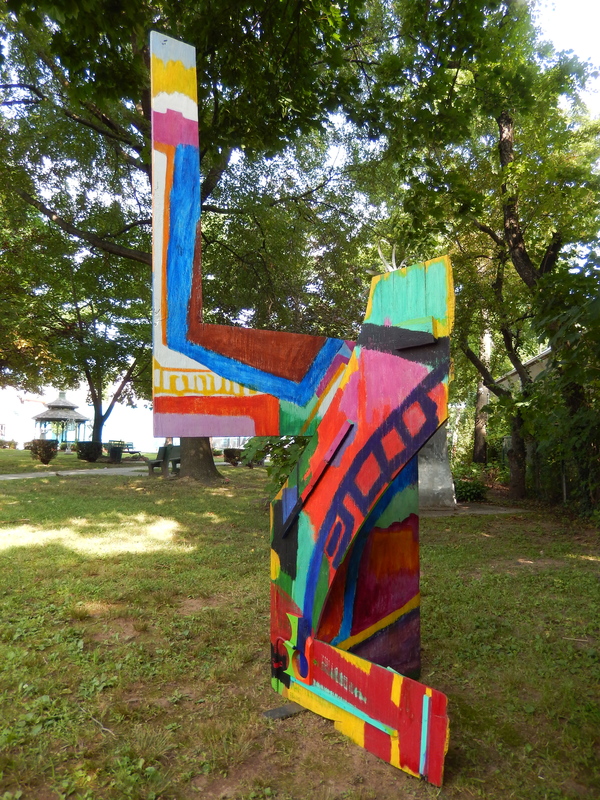 Bogdan Grom, who lived in Englewood and Slovenia until his death at age 95 in November 2013, defied classification as an artist. Born in Trieste, Italy, his artistic roots derive in color and form from the rocky landscapes of the Karst region of his origins. He survived Fascist persecution and came to the United States in 1957. 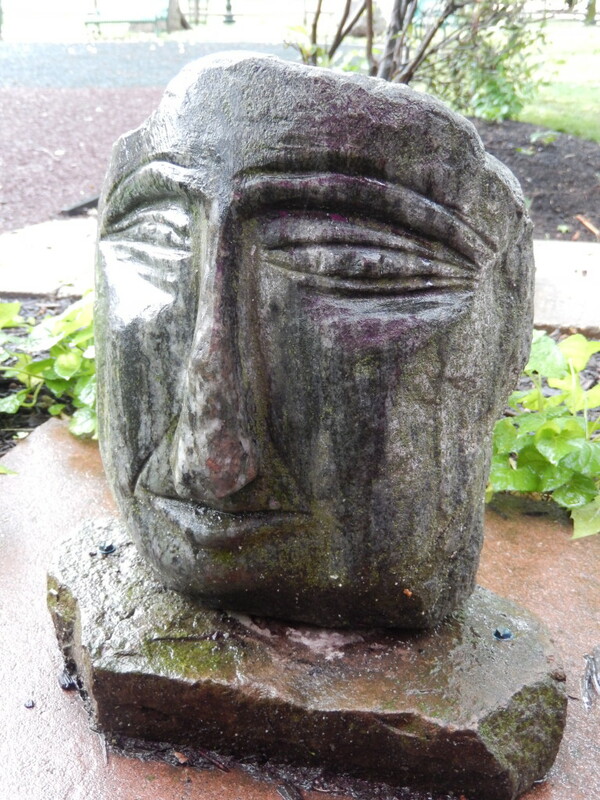 Mr. Grom worked prolifically in all mediums, from oils, aluminum, tapestry, mosaic, stained glass, fiberglass, paper, and wood. 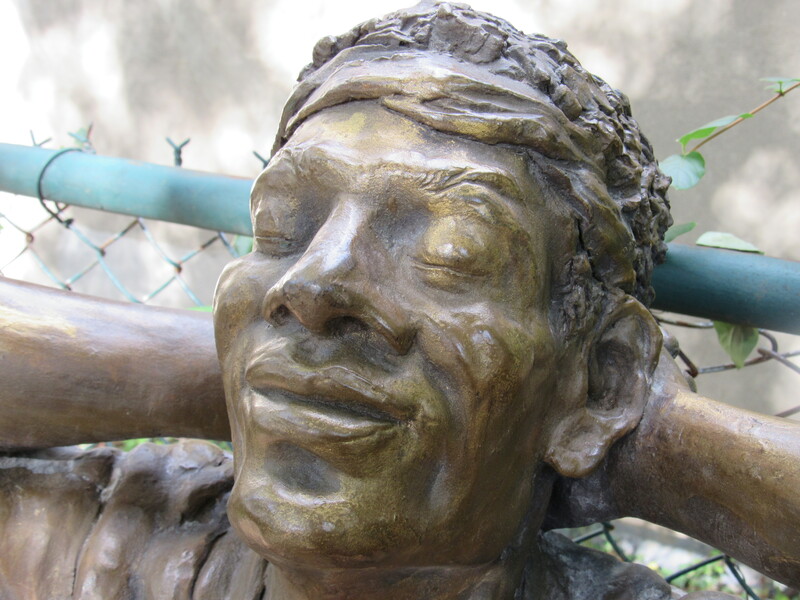 His work in painting, sculpture, print making and designs related to architecture have been recognized in private and museum collections worldwide. 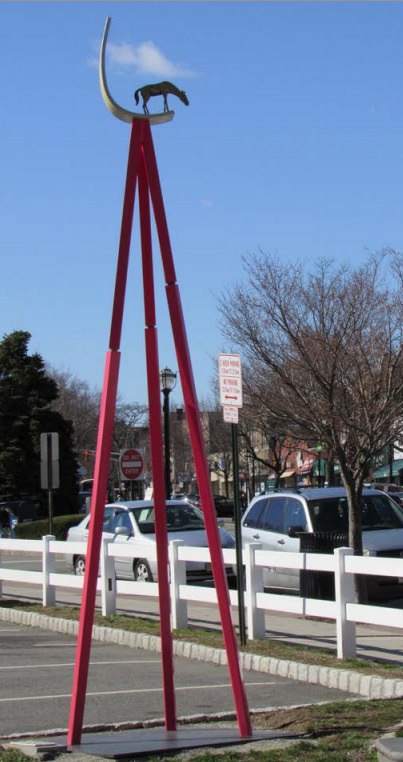 His most visible public art…sculptures and mobiles designed to beautify America’s earliest shopping malls…is represented by the two fiberglass seals now happily displayed in Leonia. 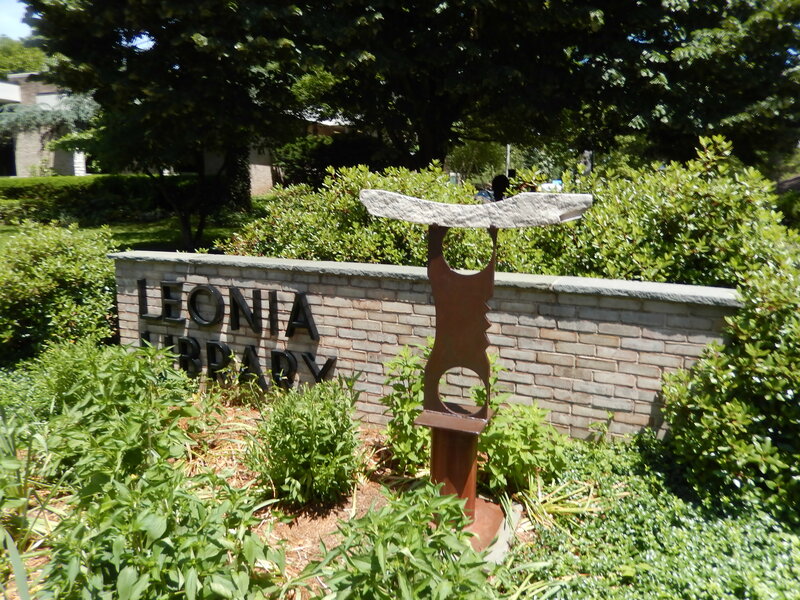 Sculpture for Leonia thanks Ms. Nina Woodrow of Englewood, New Jersey, for donating the seals to Leonia. Their whimsical grace charms all who see them. We are truly grateful for this gift. Various Metals & Sapele Mahogany 10′ x 4′ x 4′, Located on Fort Lee Road on the Leonia Public Library front lawn. 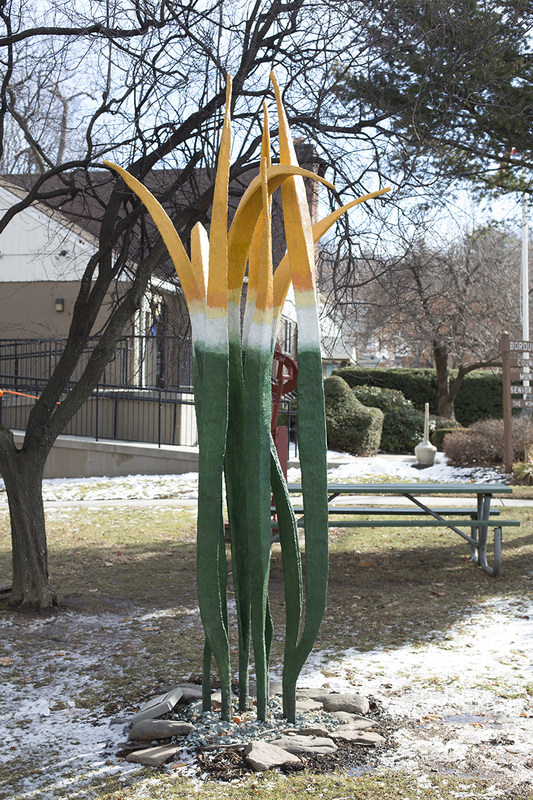 Continuing my journey on technology and farming this sculpture was inspired by the evolution of corn. Corn is a staple crop that’s importance lies on feeding the world. As the human population continues to rise we depend on farmers to increase global food production. Farmers have been selecting the most productive plants and seeds from their crops for thousands of years. In the last quarter century, scientists have begun selecting productive traits at the individual gene level to create new seeds. Science has become the new machine farmers use to increase crop yields. But with this new machine, scientists have created corn plants that are no longer self-sustainable. It is now believed that if farmers stopped planting seeds tomorrow, corn would cease to exist. 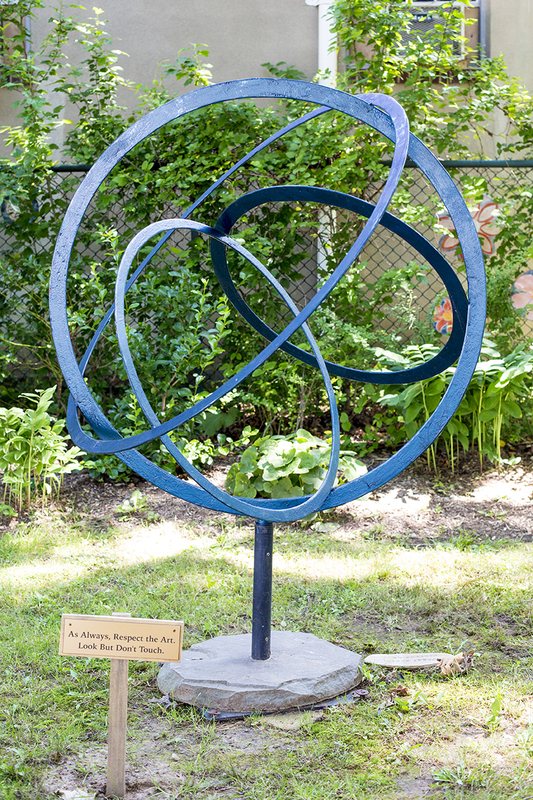 “Corn Fields” sculpture represents the force between nature and science. 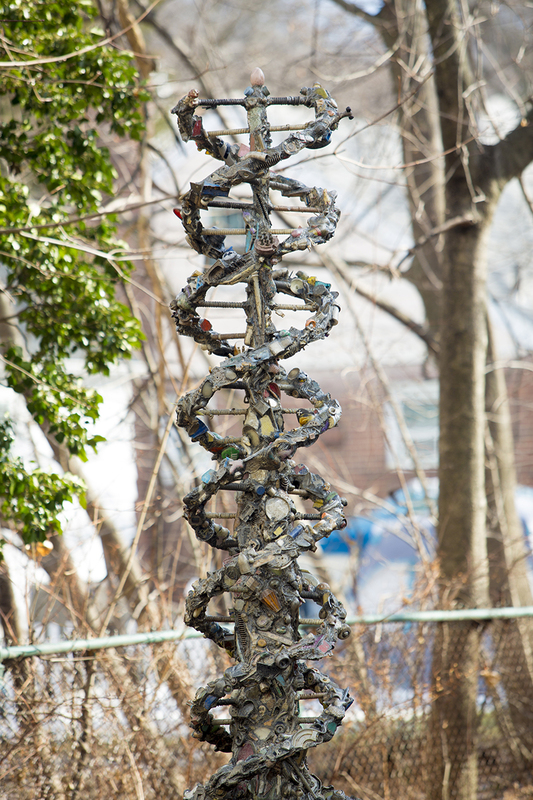 Cables with wood pieces are woven through the structure representing genetic modification of the seed. 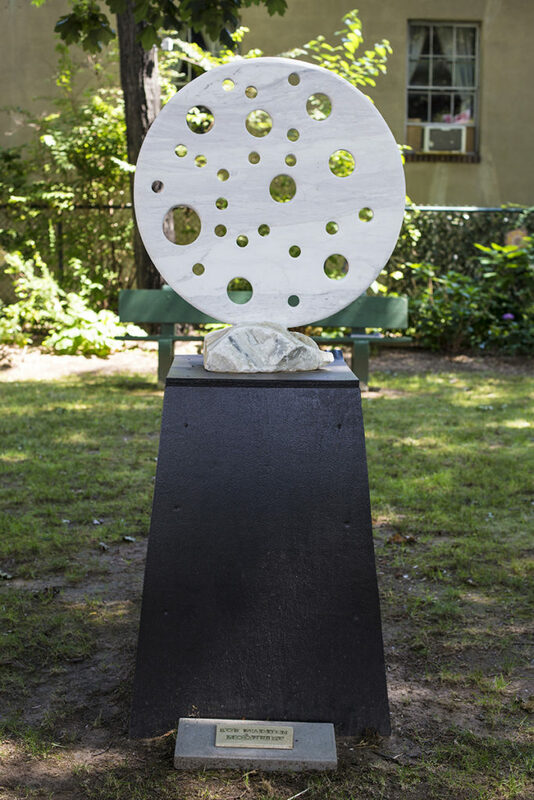 The wood pieces symbolize the original seed thus creating the web of life. 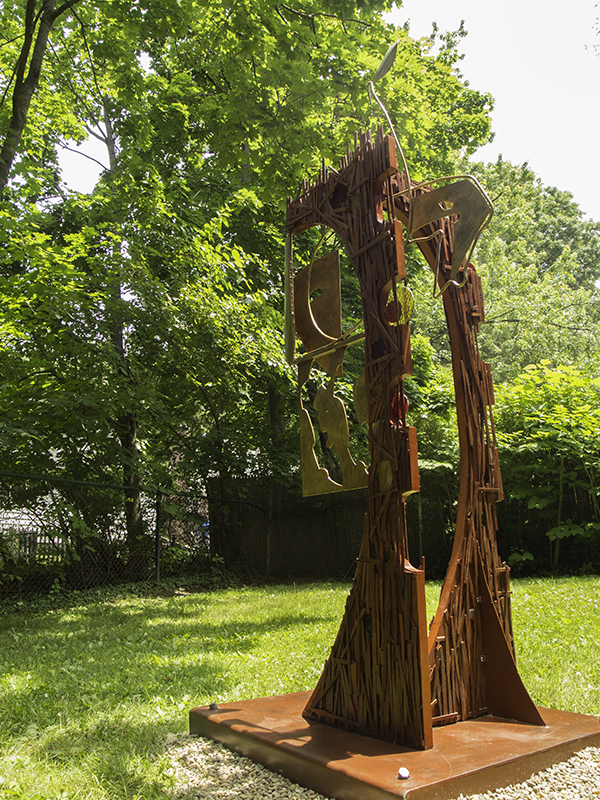 Metal, Sapele Mahogany & Glass 11′ x 2.5′ x 3′ Located in the Sculpture Garden. This sculpture was inspired by Washington Irving’s Legend of Sleepy Hollow, weaving the region’s history of folk tales together with superstitions. Sleepy Hollow is known as the region of shadows and for the witching influence of the air. The best known celebration of this time of year stems from the Celtic festival of Samhain, where Celtic people had celebrations to ward off wandering ghosts. 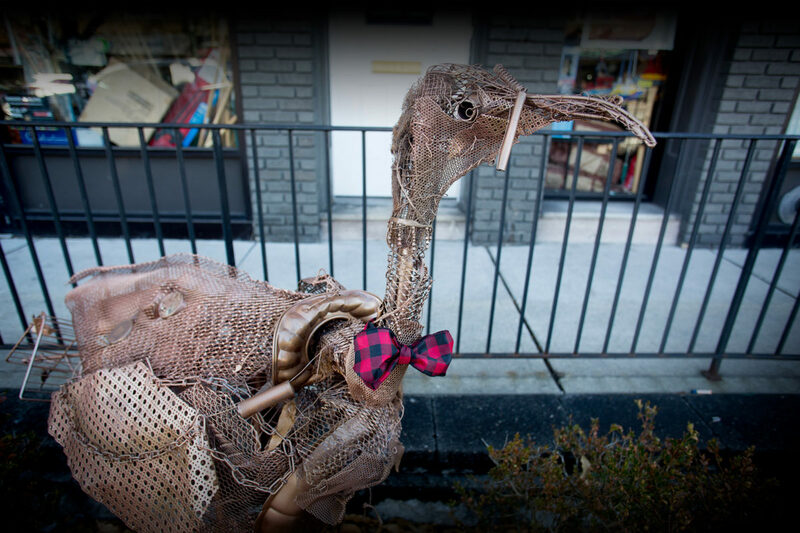 In the 19th century, the Irish immigrants brought this festival to America, which developed into Halloween. 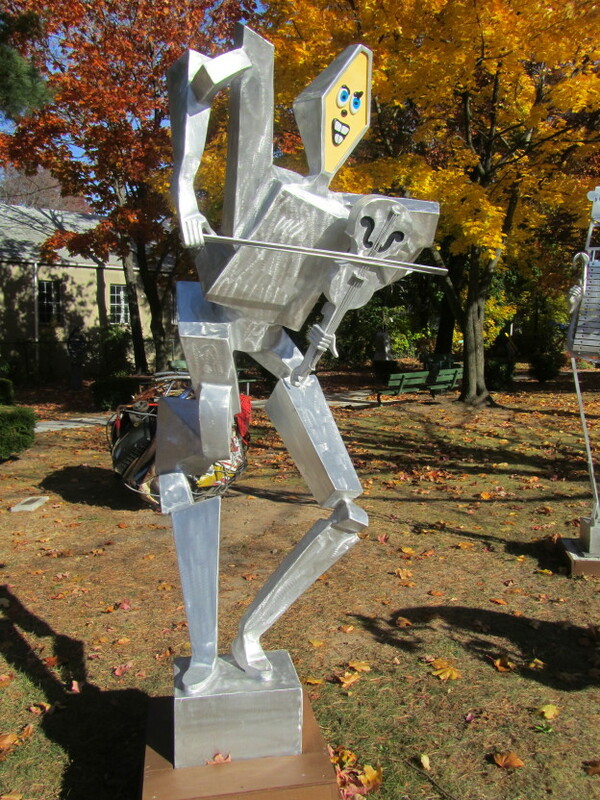 “The Legend” represents the love triangle that was the core theme in the Legend of Sleepy Hollow. 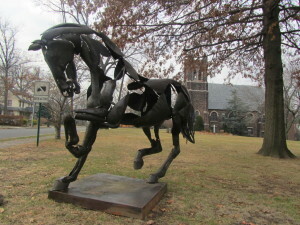 The shapes of the horse’s head and hooves symbolizes not only the horse of Ichabod and the ghost of the Headless Horseman but also the dichotomy of America and Europe, a correlating theme Irving used throughout the essay. 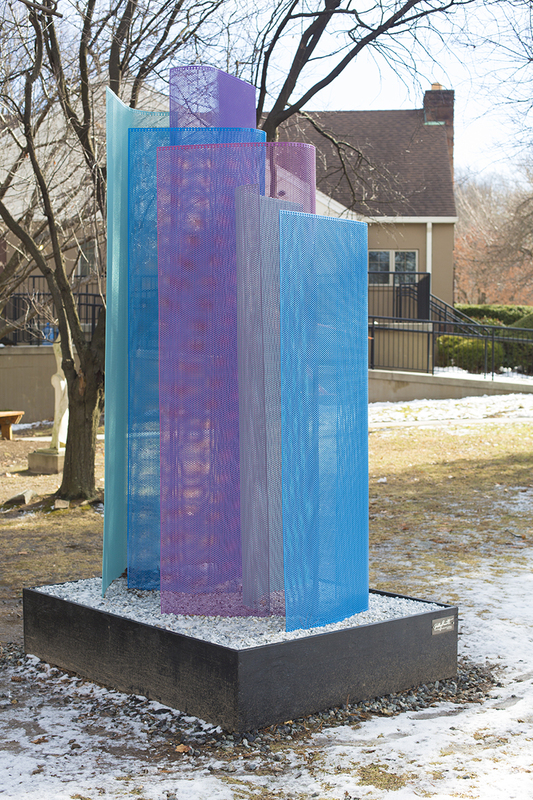 The sides of the sculpture are woven with wood and glass. The wood representing the vine of the pumpkin and the glass representing the pumpkin, the same as the Celtic legends have been woven into our culture. 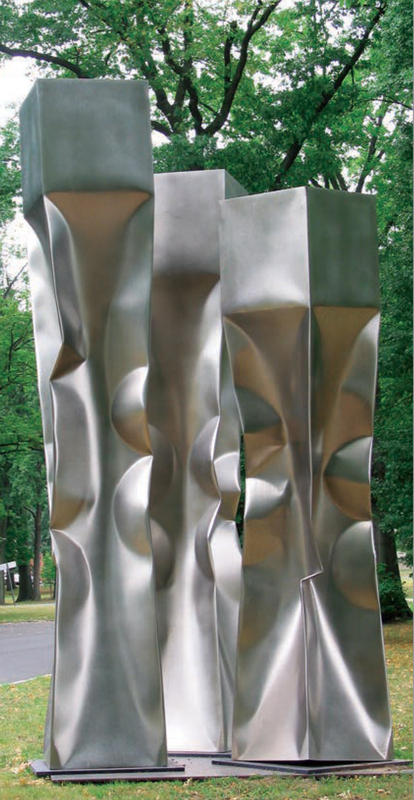 “The Legend” stands upright allowing the viewer to see shadows through the openings created by the different dimensions. These shadows create the bewitching feeling of the legend. 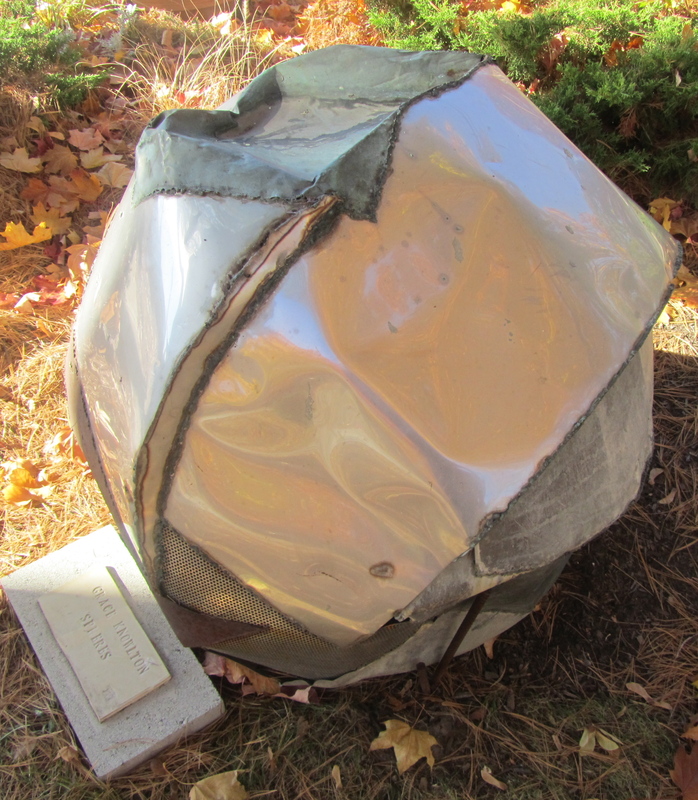 Your eye ends at the top of the sculpture with a reflective metal pumpkin head bringing to the conclusion the complexity of Sleepy Hollow. 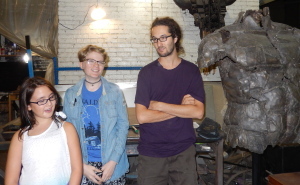 Adrian Landon’s short story contest winners had the opportunity to meet the maker of their inspirational Dung beetles in person and visit his studio in Brooklyn N.Y. Ilta Rinne (under 18 winner) and Mika Cullen (honorable mention for her cartoon) were able to see first hand where the artist works and creates. Adrian Landon is well known for his horse sculptures. 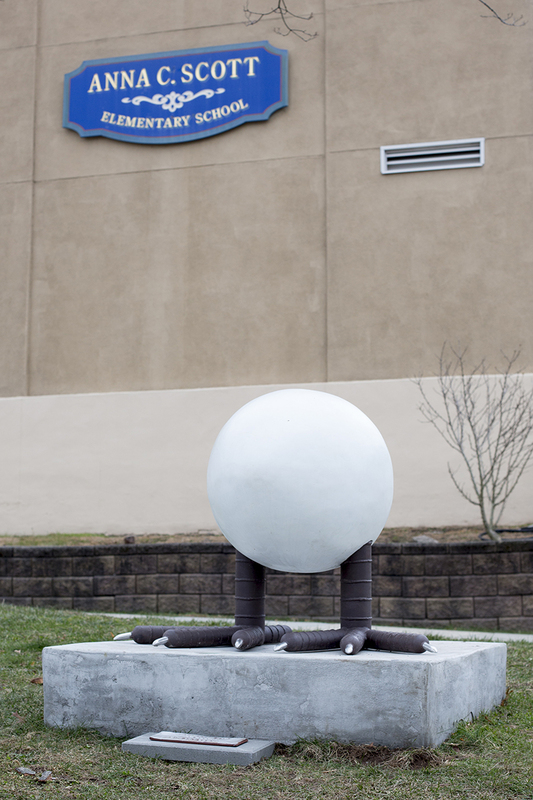 His latest creation, one 4 foot dung beetle and recycle ball and a smaller copy, highlighting our need to protect the environment was located at Station Parkway. 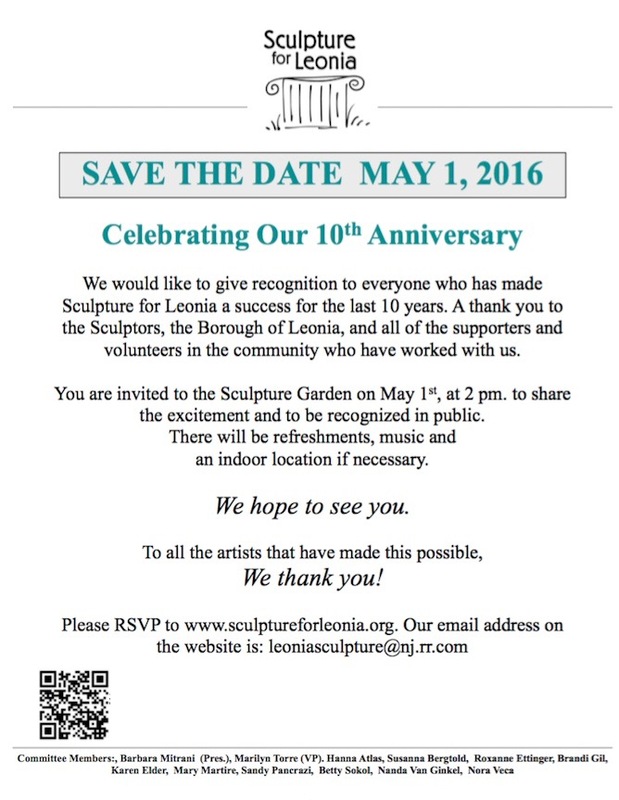 The sculptures have now departed Leonia. 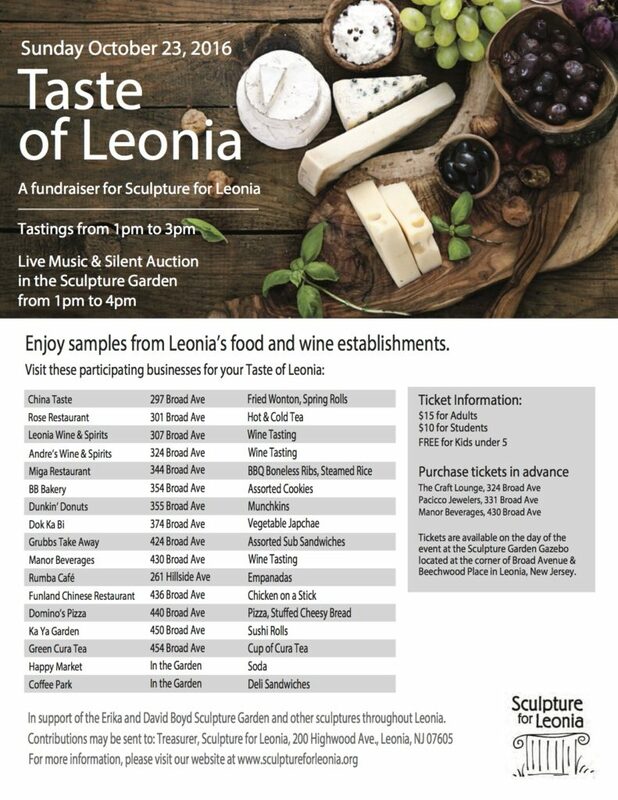 Sculpture for Leonia held a short story competition that announced their arrival. Writers could be as creative as they liked. Please find below the result of this inspiring contest. It’s not as unpleasant as it might sound, this life. Yes, yes, it’s all to do with excrement, as it were, but I’ll tell you this, you’ll never want for it. No sir, not a bit. There’s always food enough for the little ones, plus me and the missus besides. A fair dinner, some dung over your head and steady work is all one can really ask for. That’s how I see it. My father was a Roller, and his father before him, so it was only fitting I carry on and join the Rollers, too. Local 472. Oh, yes, we’re union. You’ve got your Rollers, your Dwellers and your Tunnelers. “In Dung There Is Union,” that’s our motto. It’s honest work and, truth be told, the world would be even further up to its ears in excrement if it weren’t for me and my chappies doing the heavy lifting. As it were. There’s hierarchy everywhere, no news there. Me, I’m happy in my place; rolling my ball of dung, the missus, my Gwen, ever-faithful, taking up the rear. I never wanted to be a Tunneler and certainly not a Dweller. Just not my cup, either having to haul my work underground or living amongst it. Honorable work, mind you, but Rollers don’t mix with Tunnelers, nor Dwellers either for that matter. It’s not that we’re elitist – they’re just not our sort. A different crowd altogether. Now to the point – my eldest, Ernie, has been making noise about moving out, rolling his own way. I’ve nothing against the notion of it. Every beetle grows up sometime, and when Gwen and I began our brood we always knew the day would come when the offspring would leave and find a heap to call their own. Only natural. The damnable thing is, Ernie has taken up with a Dweller! 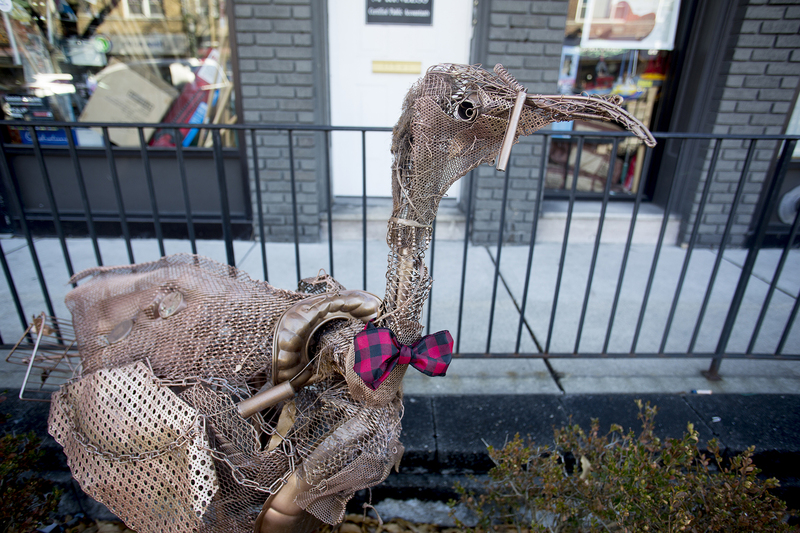 A young thing with a shiny pronotum and a mid-leg that caught young Ernie’s fancy. I ask, how is THAT relationship ever to survive? I can see it now: He’ll be out rolling all day, maybe two shifts at times, and what will she be doing? I’ll tell you what she’ll be doing – she’ll be dwelling, THAT’S what she’ll be doing. Sitting around, eating all day, her legs up! I’ve nothing against her as a beetle, per se, but we’re discussing fundamental beliefs here, passed down through countless generations, entrusted by our forbearers for continuance. Breaking with tradition can be detrimental to our very existence! It’s no trifling matter. Dung doesn’t move itself, you know. Now look, I’m a pragmatist. I understand times change. After all, who’s to say what’s “right” in this crazy, dung-filled world? Just because a certain way of life was right for me and my father – and his father before him – doesn’t necessarily mean it’s right for Ernie. Change can be hard to accept. It can feel as though everything you’ve worked for and believed in was for naught, but that’s negative thinking and I won’t be party to it. It only places one at a disadvantage in the modern world. You have to roll with the times. Mind you, it’s not for me that I worry – I’ve lived my cycle – it’s for our offspring. They’ve yet to learn the lessons of the past. Too busy living in the moment, their heads in the dung. Perhaps that’s the natural order of things. What these young beetles don’t understand is that a bright future’s no sure thing. It wasn’t so long ago that our kind suffered deprivation on a huge scale. The dung lines. The riots. Don’t think it couldn’t happen again – that’s a classic lesson of history – you must keep one antennae in the future and one in the past. “Times may change but beetles don’t,” my father used to say. There’s truth in that. You could work yourself into a right state over all the uncertainty. Thank goodness for the occasional moment of clarity. The other day, me and the missus were trying our best to roll a large ball up a steep hill. We were nearly to the top when, exhausted, I lost a handle on it and down it rolled to the bottom. “Dung!” I cried. Dutifully, we retrieved our ball and began the laborious process anew, only to repeat the same experience again and again! This went on all day, if you can imagine. Our energy and patience strained to the breaking point. Frustrating beyond words. I shook my head in puzzlement, “I don’t know, Gwen, but I do know a fool’s errand when I see one.” I extended my leg to help her up. “Come on, my lovely.” We both stood and walked away from our day’s toil. There’s always tomorrow. Life’s as simple as you make it. It’s only dung, after all. There’s truth in that, as well. About the Author: Ilta Rinne is a senior at Leonia High School who hopes to pursue writing as a career. Ilta has had a love for writing since the second grade and recently completed the first draft of a science fiction novel. Ilta also enjoys art, botany, and film. It was winter and the Hive Theatre was abuzz with people. Everyone found a seat. The crickets and katydids warmed up in the orchestra pit. Mae, trailing close behind her mother, felt a tickle in her clenched fists as they sat down and the music started up. Mae recognized the mayor as he crossed the stage in long strides to the podium. Wearing a silk evening tux and a proud smile, he cleared his throat. The wings of the crickets and the katydids stilled. “Welcome to the One Hundred Year Celebration,” the mayor announced. The crowd clapped and Mae’s mother clapped, but Mae kept her hands in her pockets. “Thank you, thank you. I am so very pleased to be here, commemorating how far we have come and the people that have led us to this day. Ladies and gentlemen, place yourself one hundred years in the past. Just for a minute. Picture a world weighed down by its own waste. A world suffocating on tainted air. A world in desperate need for change. 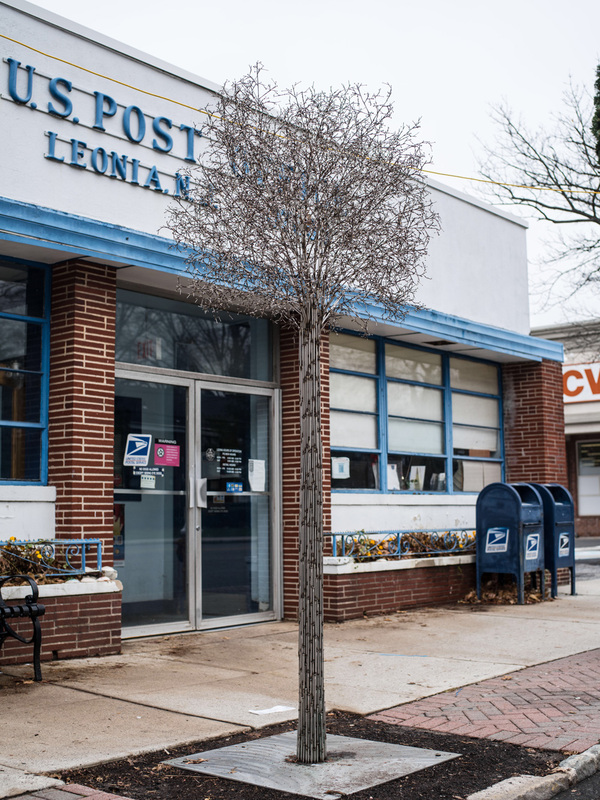 Now, come back to the present and look around you with new eyes,” the mayor said, reading his words off paper that would biodegrade in a matter of hours. He gave the audience a moment to truly look. All the honeycomb balconies that lined the walls were filled with people suddenly in awe. Mae met Shiva’s gaze. Both of them were on the floor level, sitting with their parents beside them. But the back door wasn’t too far away. And the rain had stopped as they’d hoped. The girls nodded at each other. Mae had spent the better part of the week rereading all the books she owned. Even the ones she kept some under her mattress, though they were blanketed in mold. Between the fungi-infested front and back were pages upon pages of detailed diagrams. Clocks and carburetors and convection ovens. She was ready to see it all up close. She was ready for it to be real. Mae could hardly sit still. The mayor droned on and on, but as Mae and Shiva reached the open air outside the theatre, his words blurred into a low, inaudible murmuring. The girls darted behind a well-groomed hedge and Mae loosened her fingers just enough to show Shiva that she had come through with her part of the plan. The fireflies fluttered on her palm. Their light made her skin red and showed off the webbing of her veins. Shiva pulled out the mason jar she was keeping under her folded coat. The fireflies flew quickly out of Mae’s grip, only tasting a tiny bit of freedom before finding themselves trapped inside the glass container. “Sorry about my sweaty palms,” Mae said, grinning at the little friends she picked up from the garden at dusk. Their tail ends glowed bright, almost blinding. “I can’t believe you used to flicker. ”Shiva rolled her eyes. “How inconvenient.” She slipped her jacket on and held the jar out like a lantern. “Let’s go. 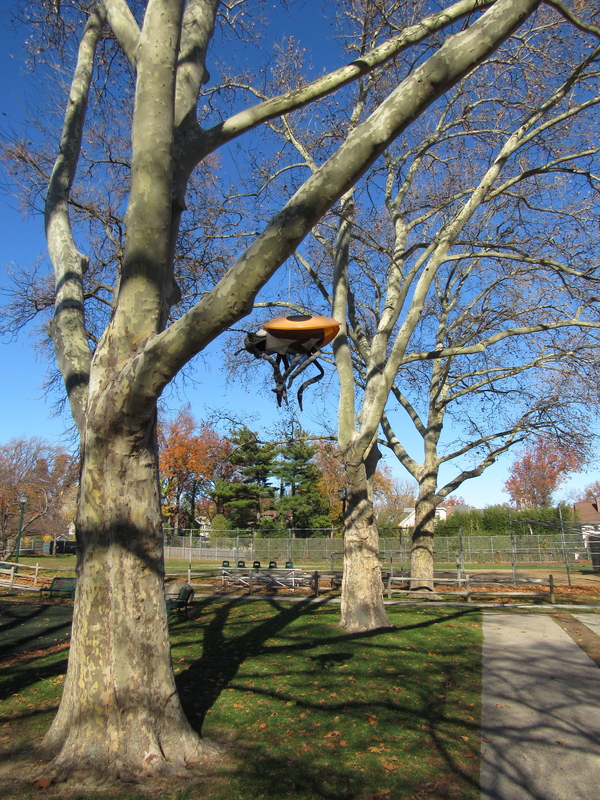 Adventure awaits.” Shiva’s cicada skin dress crinkled like dead leaves as they ran, but she loved it anyway. She would strip off the gown before bed tonight and sew it into a skirt. And in the summer, it would feel fresh and new. The sky hummed with flies the size of human skulls, but the noise fell to the back of her mind. It never stopped, so they hardly noticed. Mae watched the fireflies bounce and hit the jar lid as she told Shiva about Styrofoam. “That can’t be real,” Shiva scoffed. As they reached the west bridge, they fell silent. The thick white mesh beneath their bare feet glimmered like sugar crystals. The gigantic spiders, daytime workers, clung to the sides of the silk tunnel, moving only with the occasional leg twitch. They knew the girls were there and they knew no one was to pass over the bridge without permission and identification. Mae was light on her feet, tiptoeing and breathing through her nose. Shiva dug her toes in because it was soft and spongy. Shiva knew the spiders didn’t care. Spiders don’t often care about anything. Both girls plucked loose silk strands from the bridge. They were braided and strong. They wound them around their wrists and kept them for later. On the other side of the bridge, Mae and Shiva saw the bees were zipping around on their morning route, going from flower to flower in tedious order. They were massive, bigger than a full-grown man and fatter, too. Mae and Shiva ogled at the bees at work, legs thick with pollen. Mae and Shiva started walking again, heading into the wheat field. Aphids leaped out of the knee-high grain like overjoyed salmon. Mae remembered Shiva’s face when she found her stealing. Mae’s chest was unusually square-shaped with the last copy of Exploring A Concrete World tucked under her shirt. She thought Shiva would turn her in for sure. “That’s it,” she told her. It wasn’t long before Shiva jumped a few feet and was on the ground. There was a harsh, horrible growl in her ear. She jerked away and saw the fly, hovering inches from her face. Shiva clapped. Her hands were closed around it and she could feel the sticky, sappy blood on her skin. Mae landed next to her, but so dumbfounded by the sight of the Ravine she didn’t notice a thing. Shiva wiped her hands on her thighs. “We actually made it.” Mae could hardly believe it either. The world smelled like rust. The dung beetles roamed, not working at this hour, but restless. The valley had strict rows of balls, one after another, all metal and wiring. And beyond that was the torn-down city, still half-alive. It was the first time the girls had seen ash. The beetles would take the skyscrapers down brick by brick and roll the remains into compact spheres. The beetles made the balls about as big as themselves, both at least ten feet tall. A beetle passed by and its antennae turned in the girls’ direction. But it kept going. A shiver flew down Mae’s spine. Mae’s eyes refocused and her fingers began to trace the shiny red weavings of a crate, one of the items squished into the ball. “Look. I think it’s plastic.” Shiva knelt next to her. She looked at the plastic first without expression, then in disgust. She glared at Mae the same way. But Mae didn’t notice. Or if she did, it hardly bothered her at all. 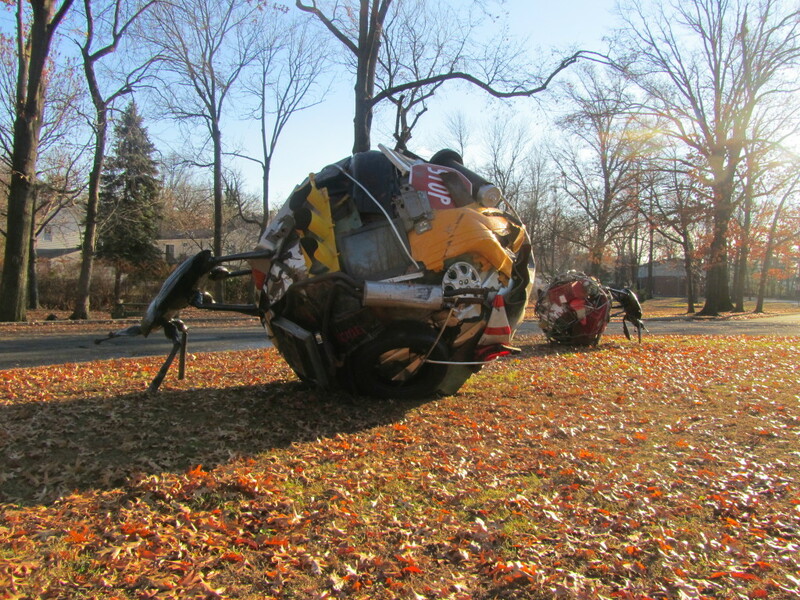 She hopped up and ran to the next hunk of metal scraps and vibrant plastic things. Her eyes grew wide as full moons and her breath drew in quick. This is what museums must’ve felt like, she thought to herself. Shiva watched her, unimpressed. But Mae just stood there, bewildered and on the verge on tears, as Shiva sighed, wanting this to be over already.“Are you waiting for me to ask what you found? You know you really picked the wrong audience for this,” Shiva said. But Mae had moved on. It was all almost too much to take in, but she did her best. She wanted to examine every scrunched up artifact with a respectful length of time, keep all the details in her head. But she couldn’t. There was no time for careful gazing. The images just didn’t stick in her head as her eyes swung back and forth. She heard a faint whispering, but she didn’t pay any attention until Shiva was practically shouting. “Run!” Shiva yelled, following her own instructions as she took off, headed towards the cliff. Mae felt the antennae sweep over her hair. She gulped, thought suddenly white dry, and looked up at the beast. The dung beetle towered over her. Mae turned around in one spin and the beetle stepped closer. Its legs with jagged points inched threateningly closer. Its head wouldn’t stop twitching. Mae was backed up against the ball, holding in her breath like that could somehow save her. Mae was moments away from wailing. But through her tears, she could see the bug up close. Its exoskeleton was just as shiny and smooth as the metal it worked with. The antennae were soft on her skin. They nudged her cheek and she couldn’t help but giggle. And even though Mae strongly believed she was seconds away from death, she reached up and pet the beetle, very swiftly, right on its cheek, returning the message. Or, at least, she aimed for the cheek. She wasn’t quite sure where a beetle’s cheek was. While looking, though, she found its eyes. They looked at each other, the two creatures, and they looked at each other for a long while, until Mae saw Shiva, standing atop of the cliff. Shiva was holding the jar close to her face. The fireflies illuminated her. Shiva was glowing and grinning, really grinning. The beetle backed away from Mae, but didn’t leave her side. In one swooping gaze over the valley, Mae saw bicycle gears, street lamps with their poles bent and twisted, a couple vehicle hubcaps, and, if she wasn’t just imagining things, she could’ve sworn she saw a real live television. What had smelled like blood or old coins now smelled like home. The beetle’s antennae were moving back and forth between Mae and Shiva. Shiva waved to her and Mae waved back, even though it was much too dark to see. Shiva disappeared out of sight, bound for home, her home. Standing in the valley with a new friend and an old world, Mae watched the light until it was completely gone. Converting all to fertile paste? And so avoid his eco-fate? 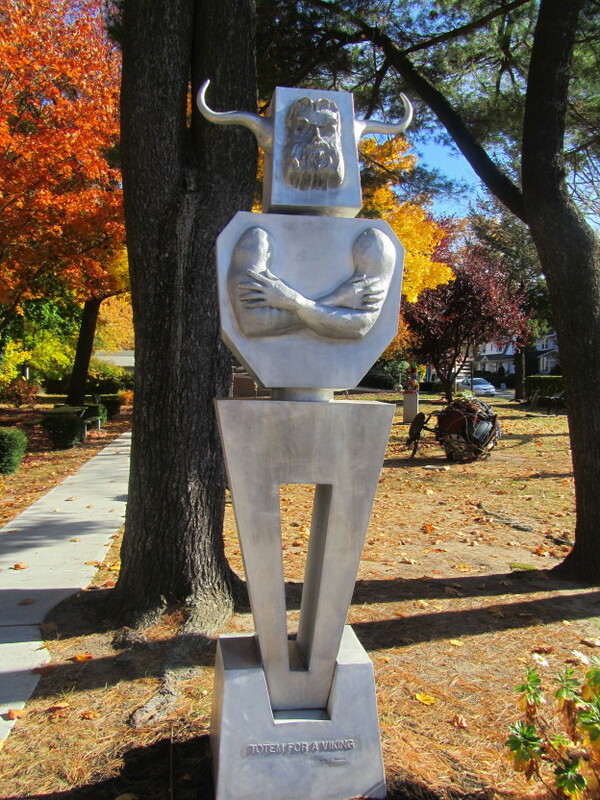 This sculpture is located in the “Triangle” on Broad Avenue between Magnolia and Beechwood Place. 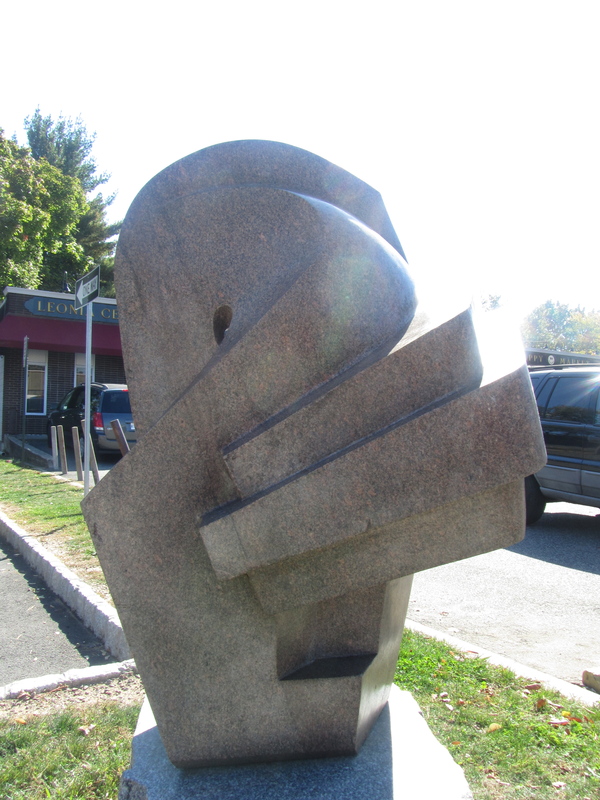 A 5,000 pound granite sculpture. 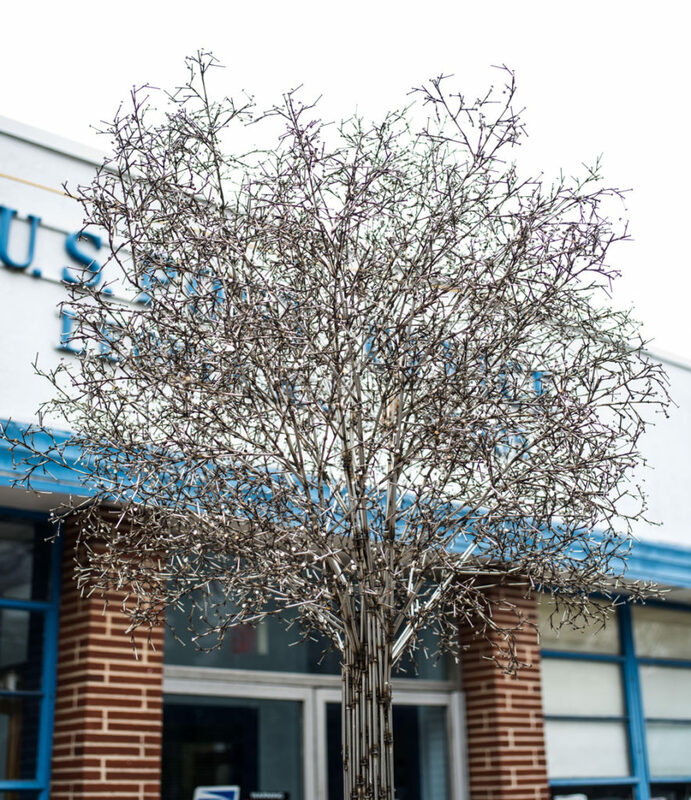 Mr. Padovano has taken what some artists consider an old-fashioned medium and created a flowing, contemporary piece with “Cronus.” “I was inspired by the music of Bach when I was sculpting this piece,” said Mr. Padovano. 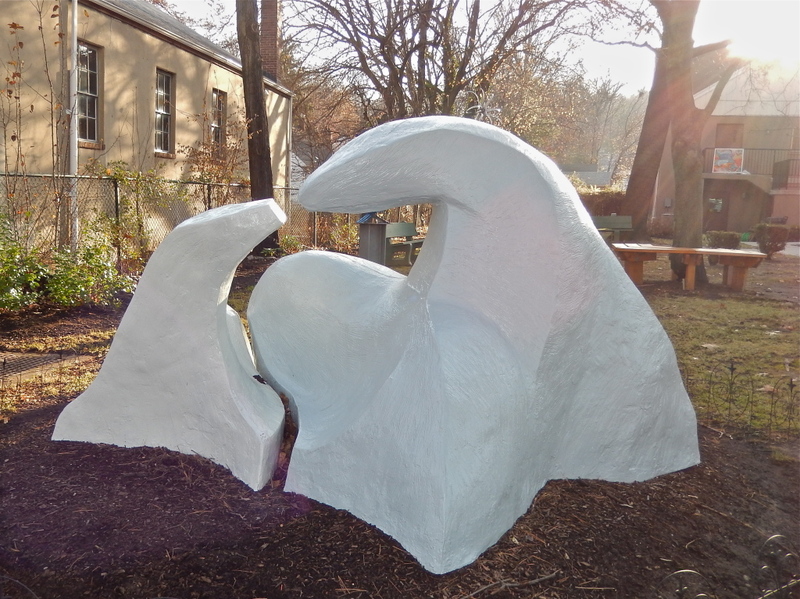 “The monumental chords in Bach’s music inspired me to make large, rhythmic forms in the granite.” Anthony Padovano graciously donated this piece to Sculpture for Leonia. 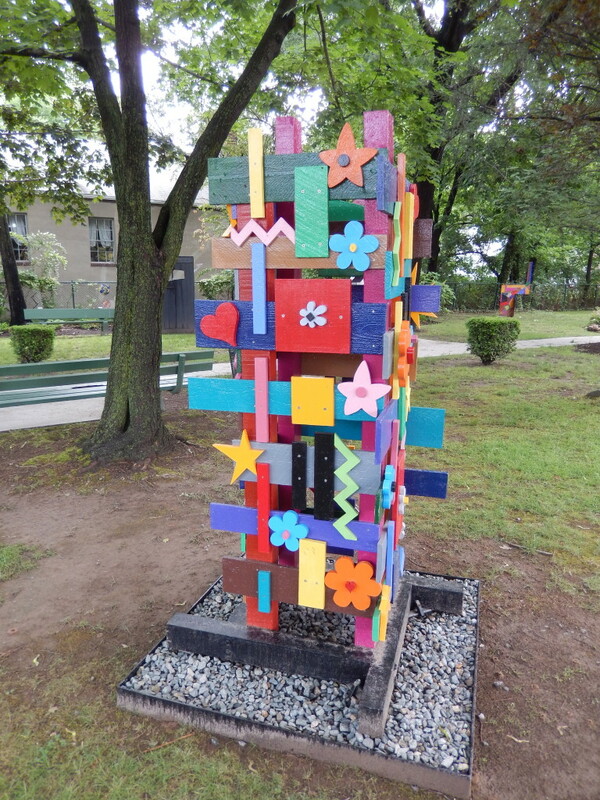 This sculpture is located in the “Wood Park” area. In this geometric vertical formation Padovano creates a dynamic modernist approach to form and color. The thoughtful interplay of rectilinear and cylindrical shapes is more than just a display of size and color, it is a still life strategically designed to create a secondary interaction of light and shadow that adds further volume and line extension to the larger primary forms. 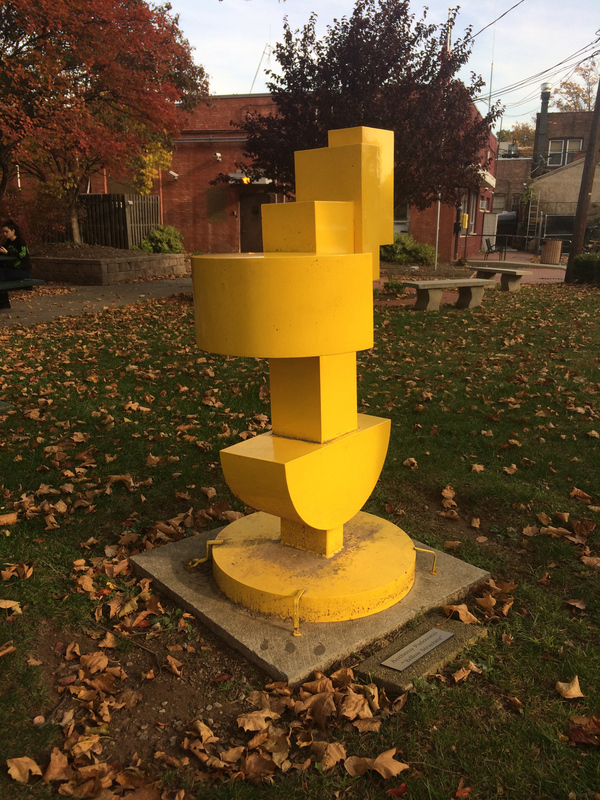 “Yellow Structure,” though constructed in a distinct, individual voice, is from a larger colorful series that was exhibited in the Whitney Museum. Padovano has worked with various media in a wide range of styles over the years; his success, he jokes, comes from not letting himself get in the way and permitting every piece to come to life on its own. 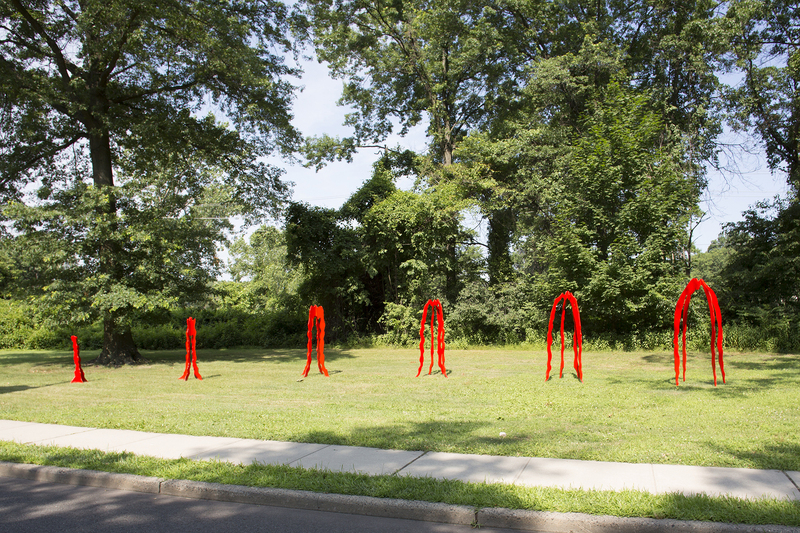 Anthony Padovano has been awarded the Prix di Rome, a Guggenheim Fellowship, a Ford Purchase Award, an Olivetti Award from the Silvermine Guild, and a Gold Medal for Sculpture at the National Academy of Design. 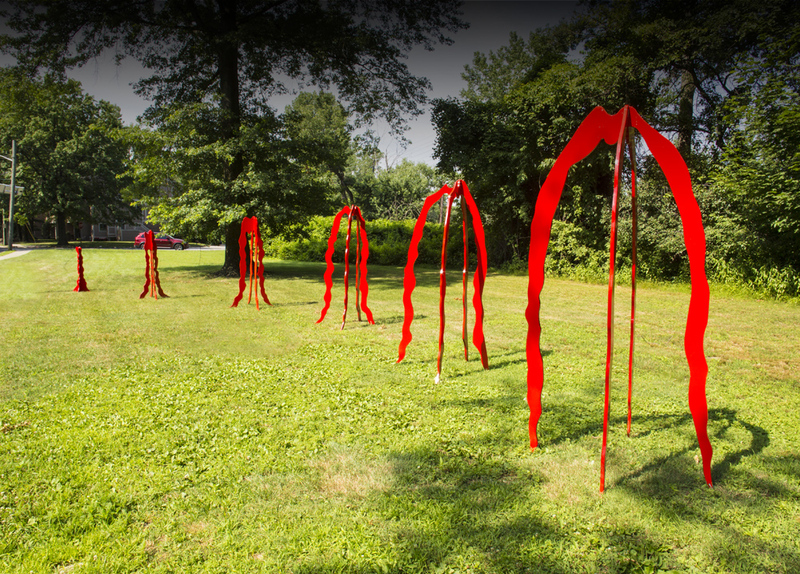 His work can be seen at the Whitney Museum of American Art, Wichita Art Museum, and The National Collection of Fine Arts, Washington, D.C. among other venues. He has written The Process of Sculpture, published by Doubleday and Co. 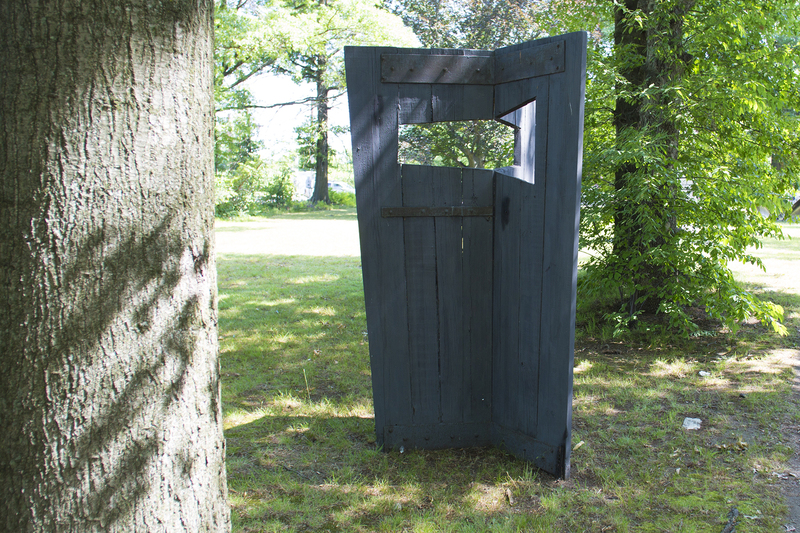 Traditionally a sculptor who works with metal, Dan Bergman veered to wood with the creation of “My Father’s House.” The carved out space in this sculpture represents the house. It is visible from every angle of the three-paneled display. Dan Bergman grew up in Chicago and Cleveland. 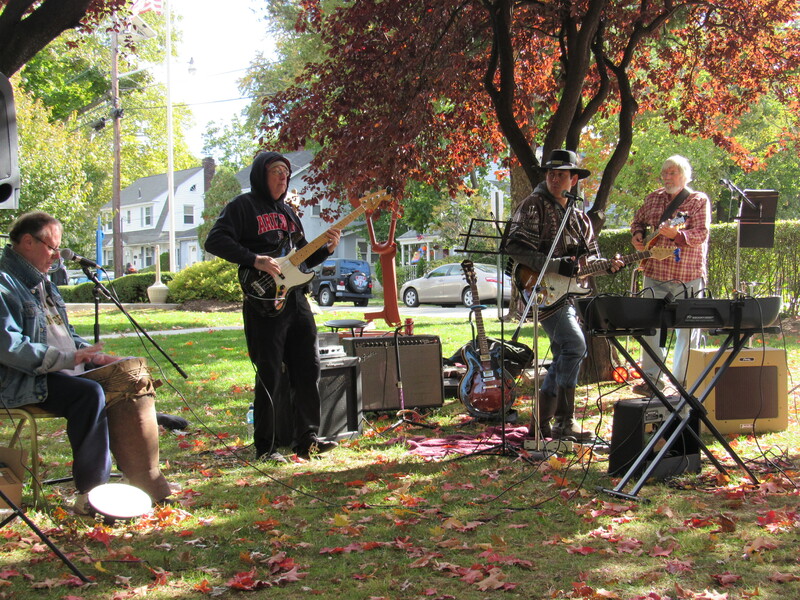 After a 30-year business career, he began studying at New York’s Art Students League. 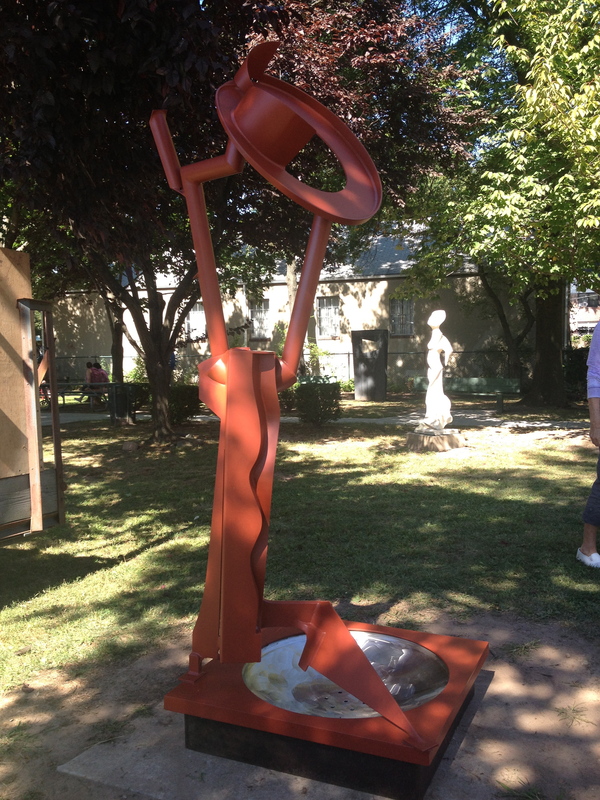 His sculpture has been exhibited in many solo and group shows, and he has executed a number of public works. 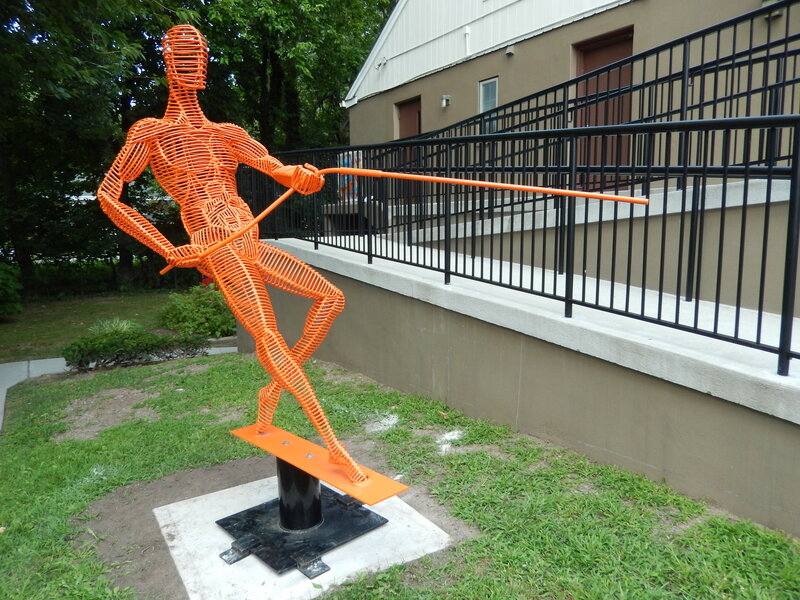 He is known for intense, convoluted welded pieces, wind-driven kinetic works, and explorations of mathematical structures such as “tensegrity”. 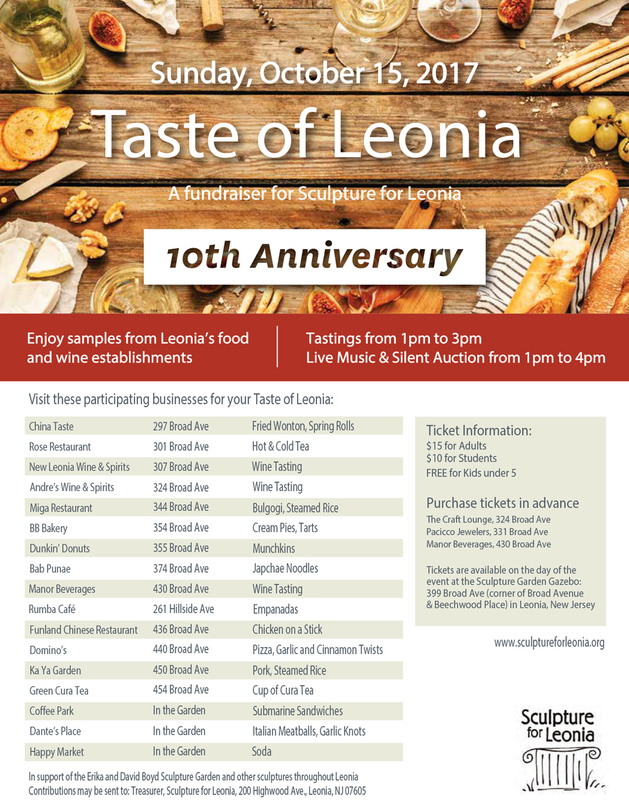 My Father’s House has been generously donated to the Borough of Leonia. 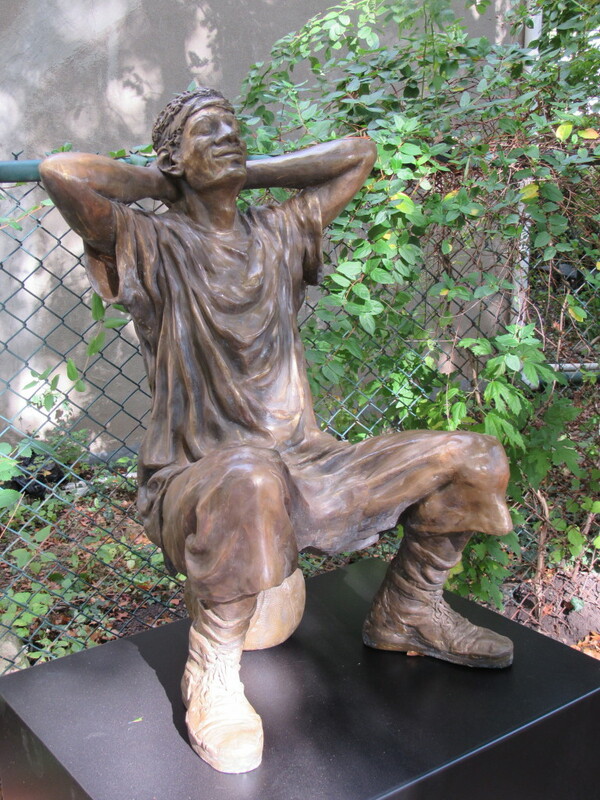 This life size sculpture made of plastics, fiberglass and resin is located in the sculpture garden. This sculpture depicting a seated female figure in solitary introspection, originated as one of three figures on three separate beds situated side by side. 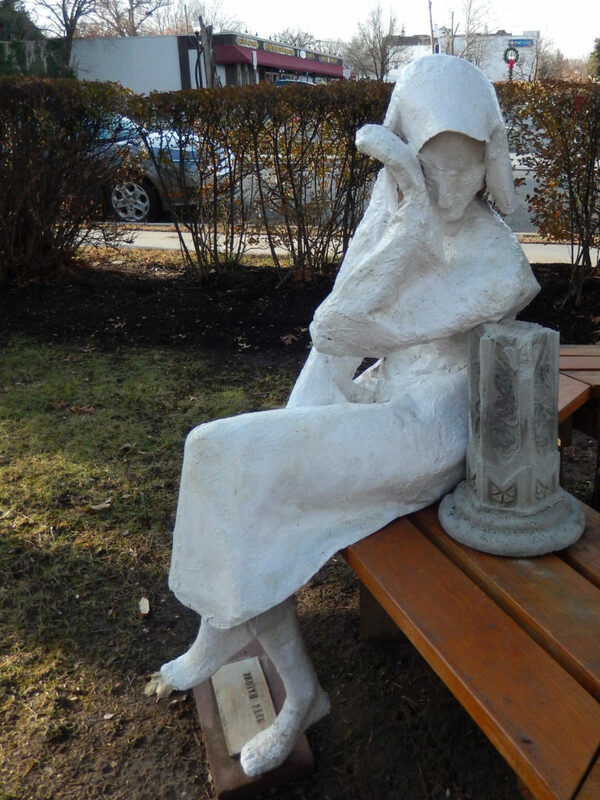 Although different from the original concept, the lone figure now seated on a round bench in the Leonia sculpture garden is able to stand alone as a complete sculpture. Each of us is ultimately alone, though from the moment of birth we require the support of others. The title for the grouping titled Isolation conveys the visual aloneness of each individual even in such an intimate setting as a bedroom: a male rising from his bed demanding to be heard though no one appears to listen; a female straining to speak though she cannot find words to express her thoughts; this woman now seated on the bench who has withdrawn and given up trying. 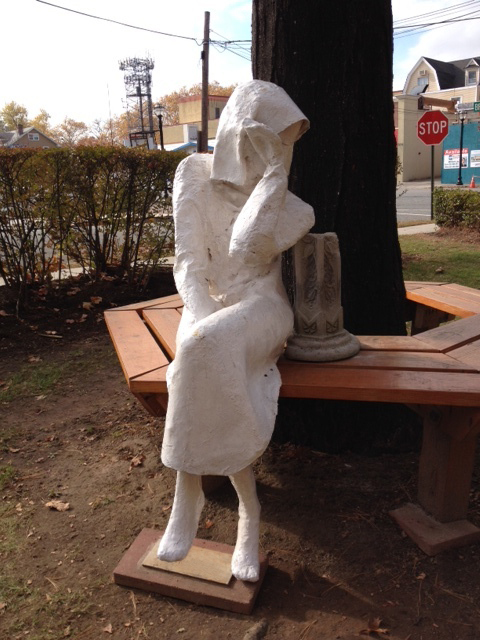 Perhaps you can sit beside her and tell her there are other ways to be heard and to belong. 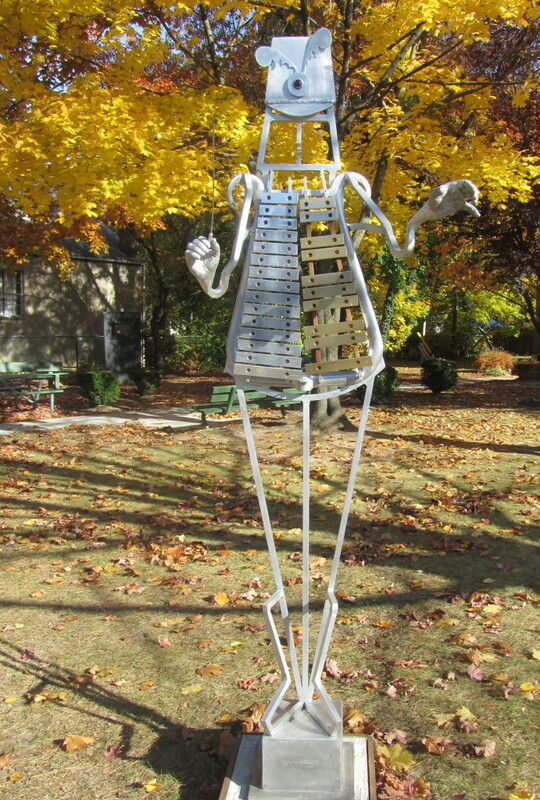 Judith Peck, describes her sculptures as being inspired by people – how they look, speak, and act; how they endure travail and tragedy; how they celebrate joy. They address thematic concerns about the choices people make and the choices made for them by history, by chance, and by the intensities of their emotions and experience. The landscape of people is an infinite terrain full of vitality, pain, and joy. It is always changing. 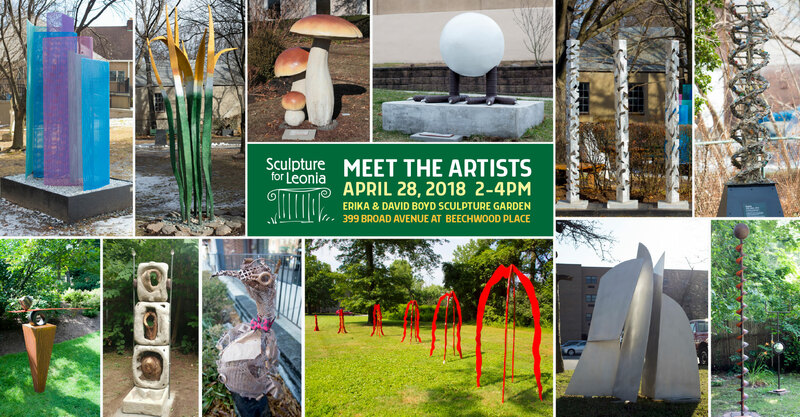 The artist is too changed as she explores familiar and unfamiliar places with the tools of carving, molding, and fabrication in hand. 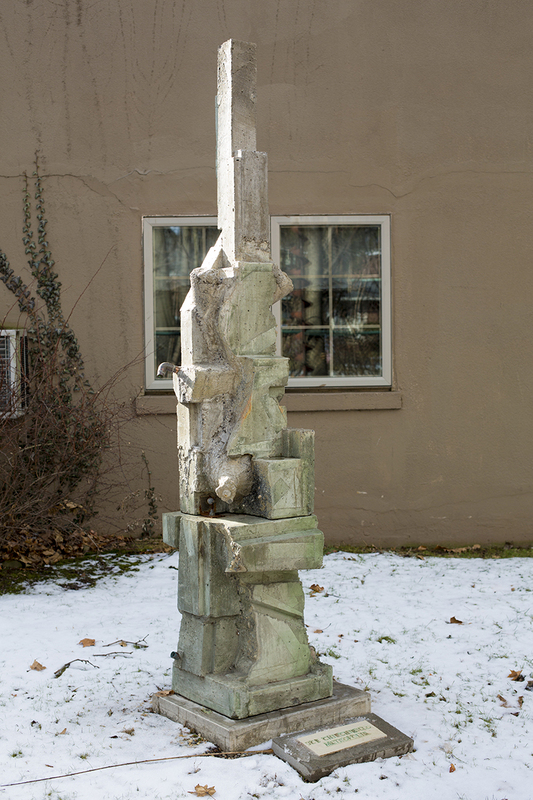 This six-foot terra cotta sculpture is hollow and stands over a single support. 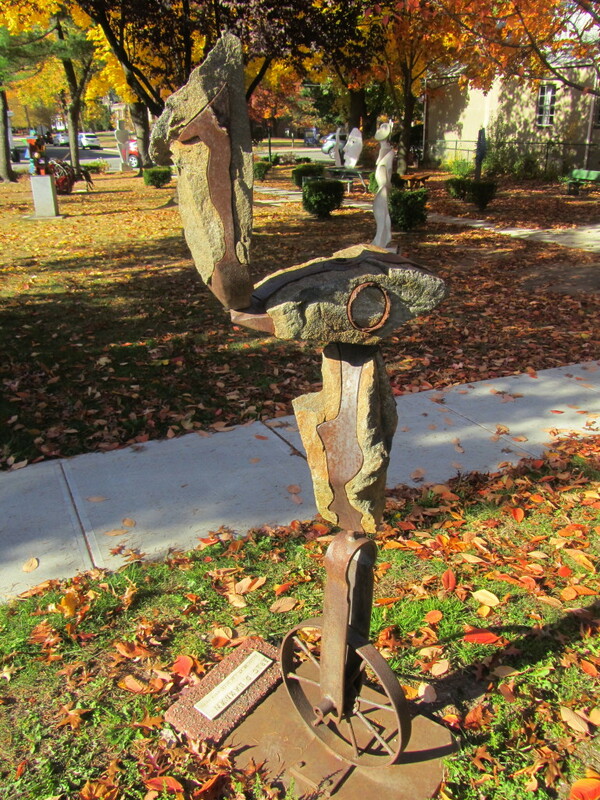 The work reflects the variety of tools used by the artist. Clay was pulled, pressed, and dragged to build the forms, silhouettes, and motifs of an abstract figure whose interrelationships express the process of its creation. 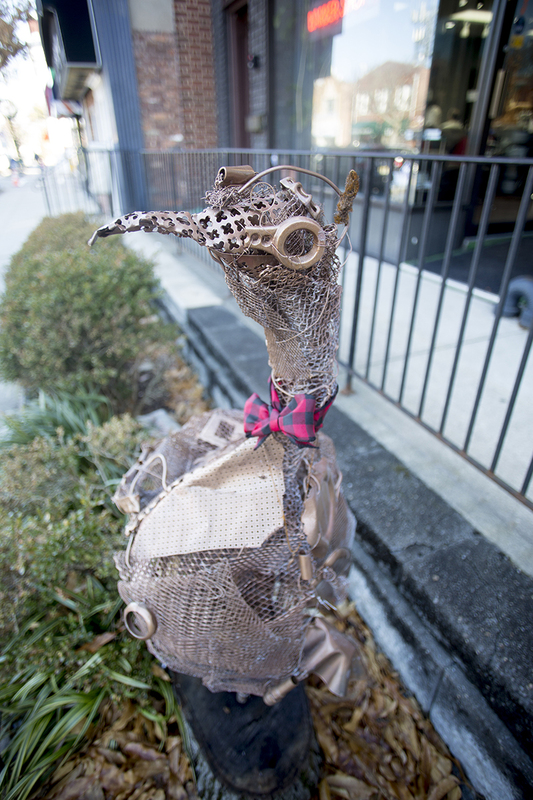 The artist’s choice of material relates directly to the natural world. 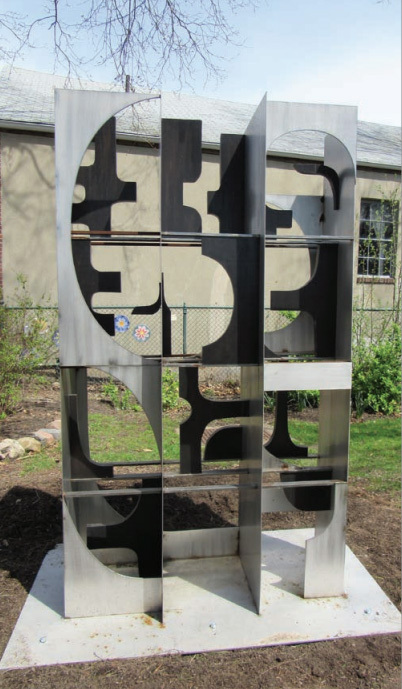 The piece captures the dualities of strength and fragility and vitality and stillness in both its creation and expression. Marilyn Friedman studied at the Art Students League of New York, Skowhegan School of Painting and Sculpture, and the University of Siena, Italy. 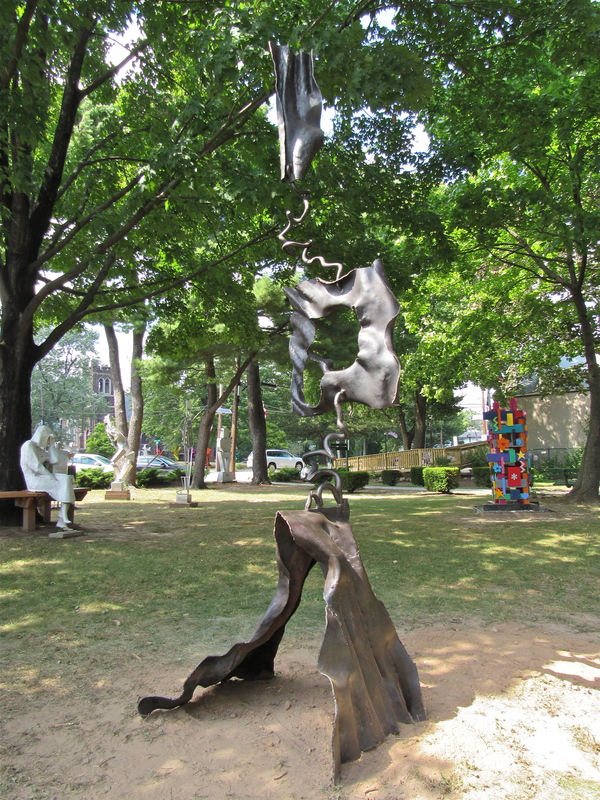 She has received numerous grants and awards for her works from organizations such as the National Academy of Design, the National Sculpture Society, and the National Arts Club. 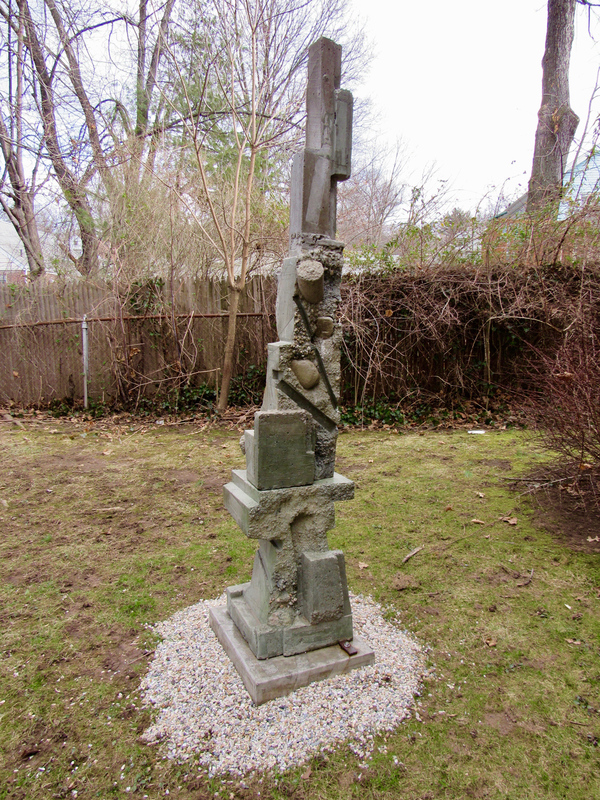 Marilyn Friedman’s work is in many private collections. She has also created commissioned sculptures for Kohler, Lufthansa, and Absolut. 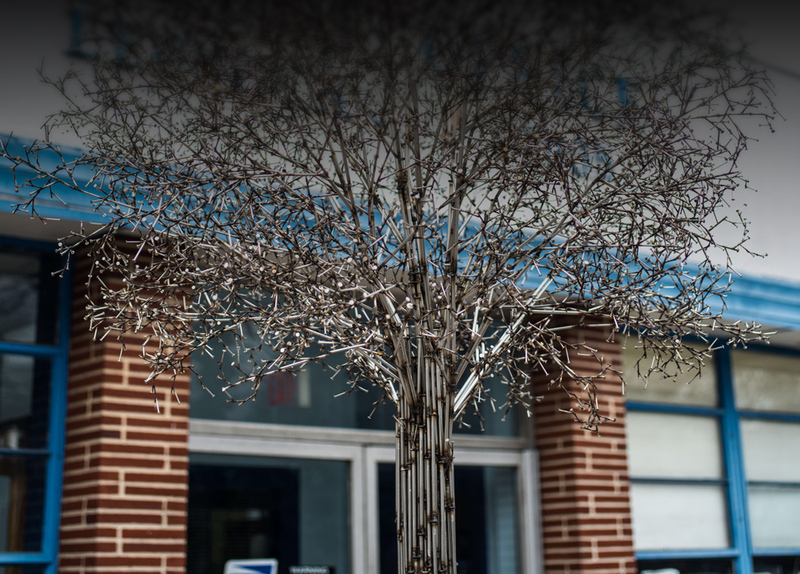 She has taught sculpture at Parsons School of Design and Montoya Art Studios, and is currently teaching at the Art Students League of New York. 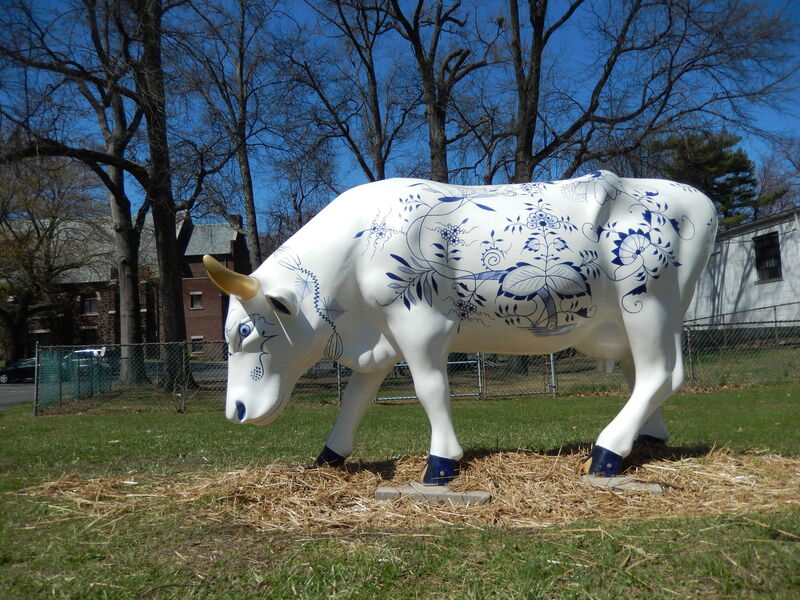 This fiberglass cat was part of a public arts project in the Catskills during the summer of 2014. It was sponsored by a local tourist organization and chosen to be the “raffle” cat in the fundraiser. I attended the gala and auction of the other 50 cats and purchased several raffle tickets for my cat at the last minute; – To my great and pleasant surprise, I won my cat back and have exhibited it ever since. 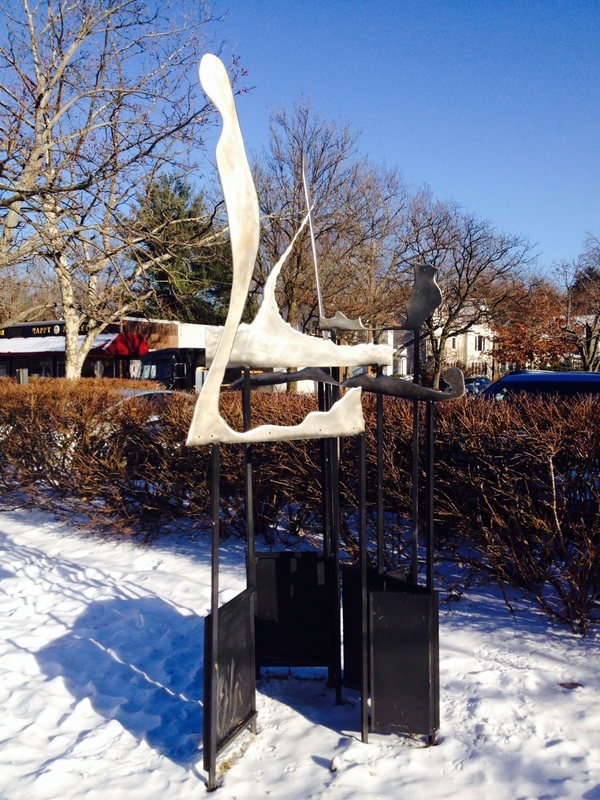 The cat is now located in Leonia’s sculpture garden next to the gazebo. 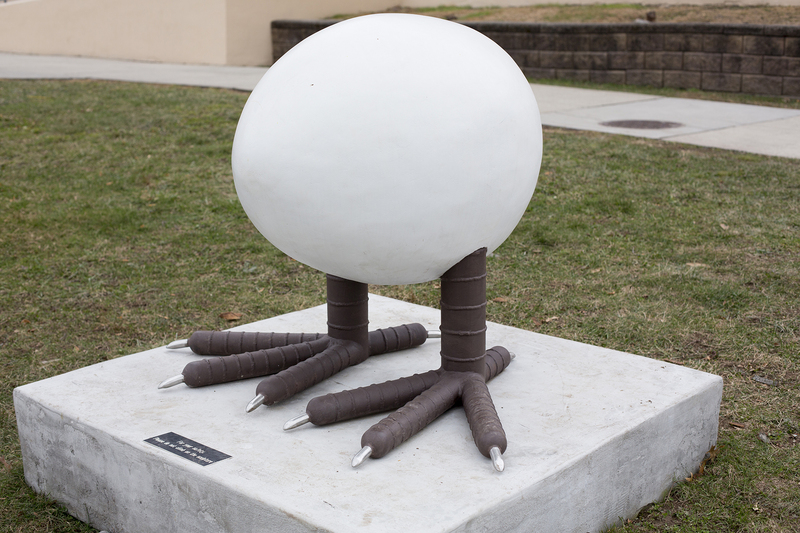 I enjoy participating in public arts projects. 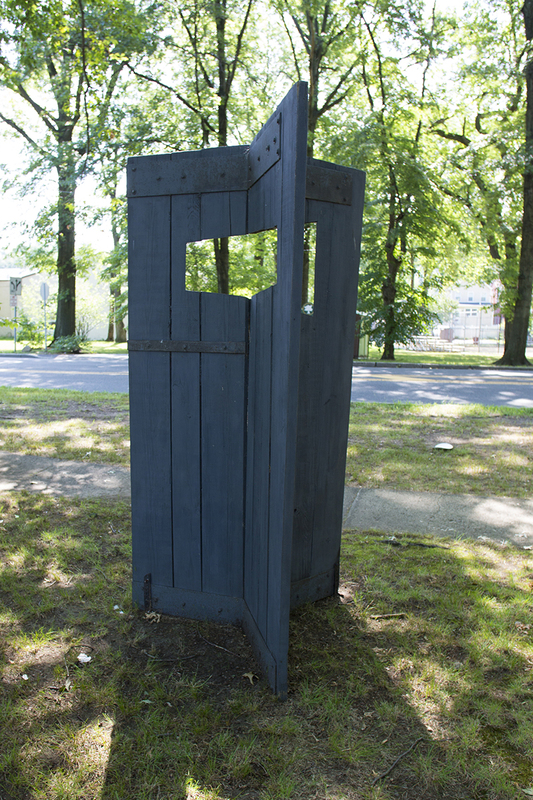 My images are covering traffic control boxes, recycled doors and rain barrels. 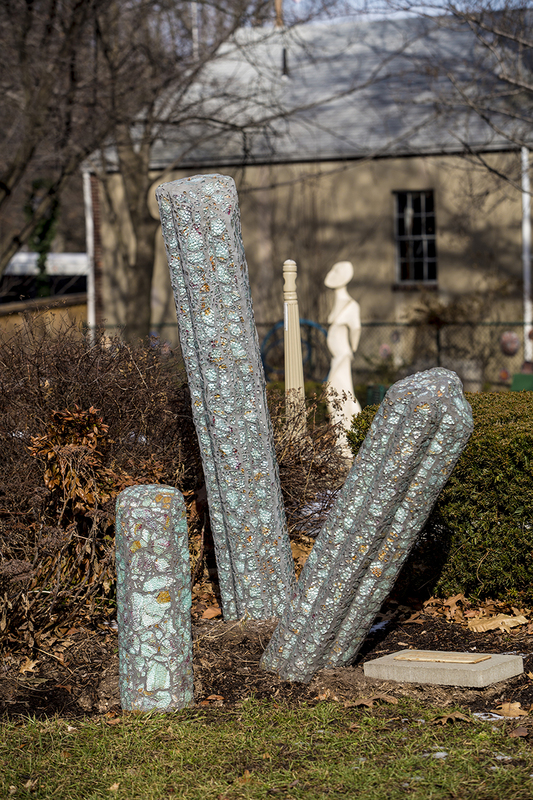 It is a pleasure to see a delighted public visiting Main Street or a sculpture park, walking from one sculpture to another, admiring its shapes and colors. 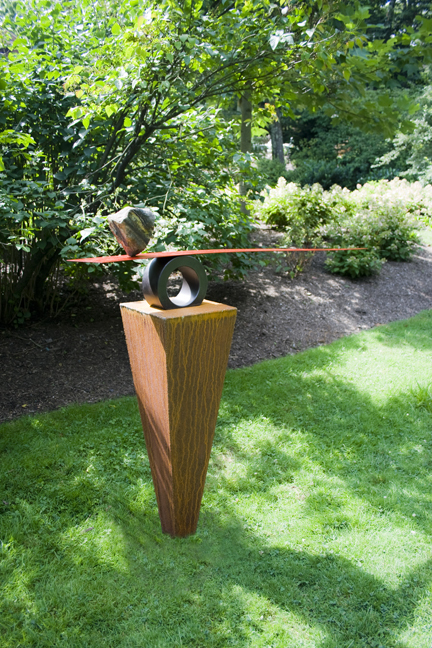 This sculpture is located in the sculpture garden. At every construction site dumpsters seem to be overflowing with wood, new as well as old. 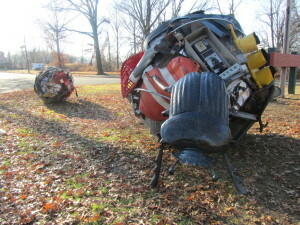 Pallets, having carried heavy materials, are being discarded. There seems to be no further use for the wood. – Wrong! – For some time, I have been picking up pallets to take apart and use in artwork. Creating outdoor sculpture is my preferred art form – at least right now. There is no limit to size of the artwork, there is lots of exhibition space, and many more people have a chance to see it. Preparing the wood properly and using high-quality paints, acrylics as well as oils – covered with varnish – preserve the artwork and make it last many years – even when exposed to the elements. After horizontal pieces of painted boards were attached to the 4 verticals, it looked like a weaving. Since I was concerned that it might be too rigid, I started to attach playful shapes, also cut from pallets, which changed the piece completely. National boundaries are slowly becoming faint as a global economy slithers through the myriad of cultures around the world. The unique indigenous flavors, colors, habits, sounds and ideas, which have peppered the earth, can no longer be protected by distances. Cultures are being assimilated, diluted and sometimes ingested or coerced. The digital world might be seen as having created an atmosphere, a WAVERING TWILIGHT, of the distinctions that have been the origins of cultures. Herb Rosenberg is a left-handed Aquarian art-maker in the tradition of some of history’s most zealous artists. His studio is never without works-in-progress in progress. 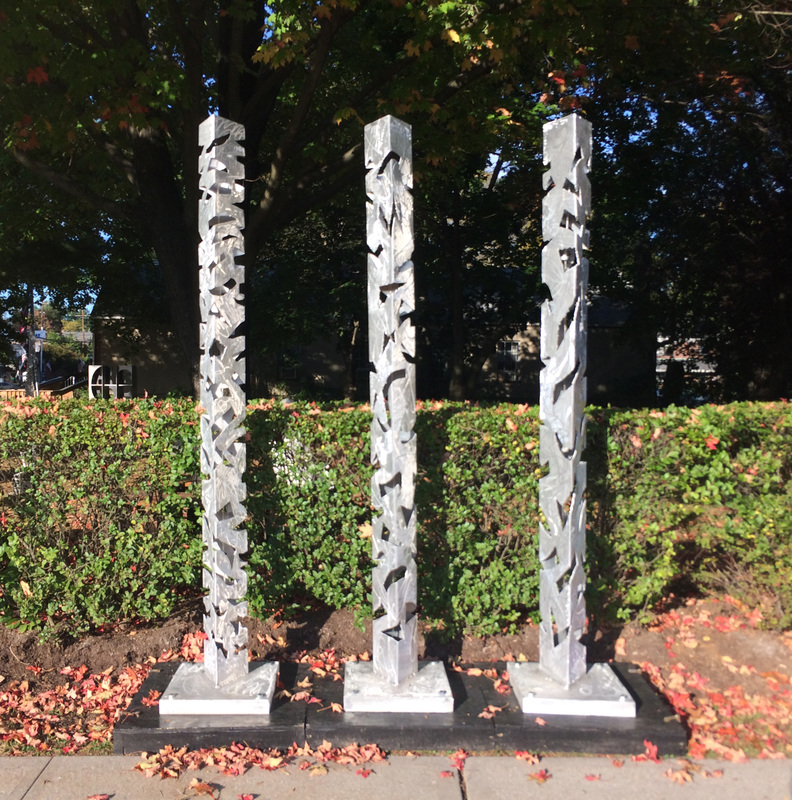 Currently one would see a nine-foot tall aluminum column in the works. 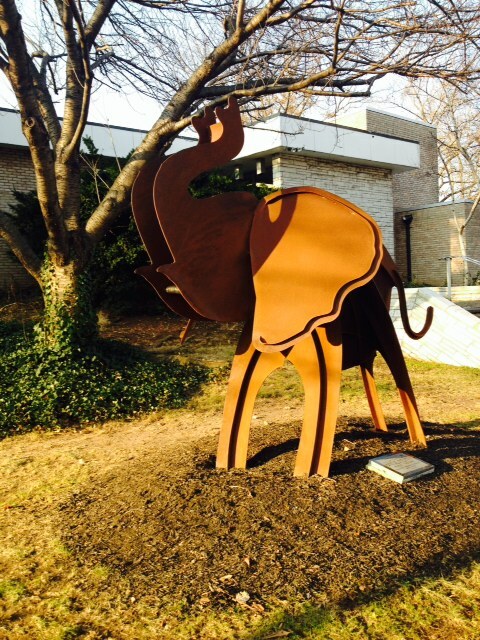 This piece is located on the front Library lawn on Fort Lee road. Murray relies on unusual means to forge these coherences. From experience navigating ships as a merchant marine captain, a one hundred-ton master, he intuits trajectory lines through space. 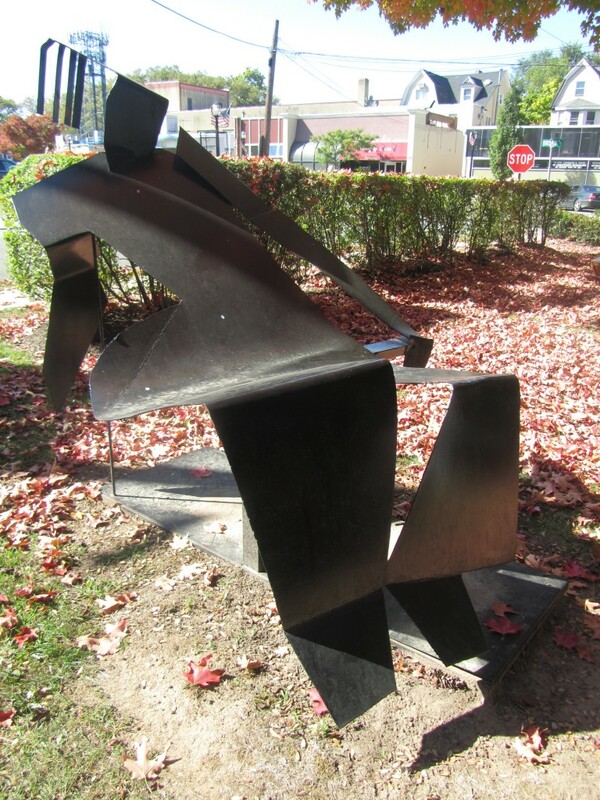 In his lifelong work as a sculptor, he manipulates abstract chunks of form or a specific image of a basic house shape as if guiding ships tossed on waves. Objects under his watch never fall out of range but hold to the edge. 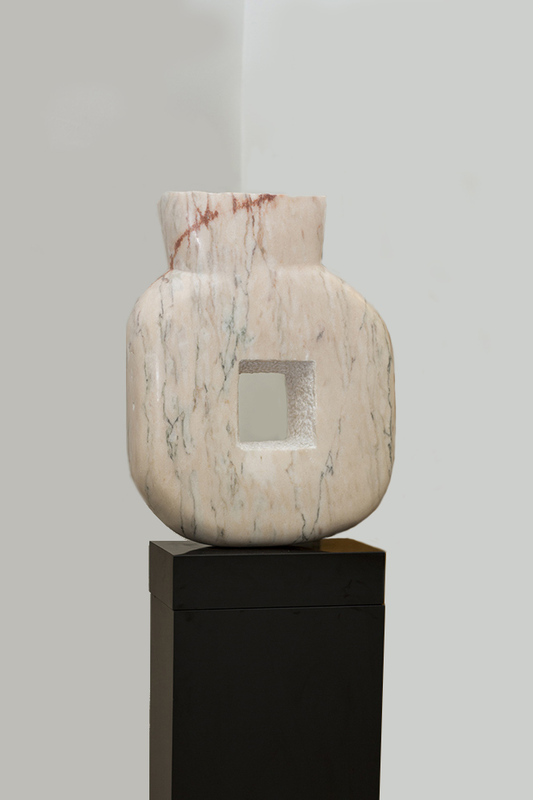 The stacked stones and wood blocks are drilled to receive an internal metal rod invisible to the viewer who must suspend disbelief in order to approach and reconfigure the piece. 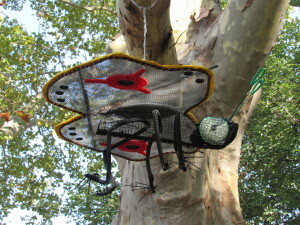 These super bugs are made out of metal and mixed media. 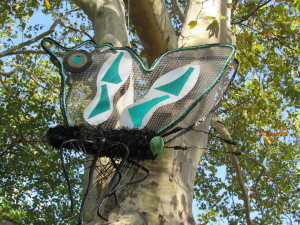 A Lady bug, Butterfly and Lightening bug are hanging from the trees in the Wood park area. 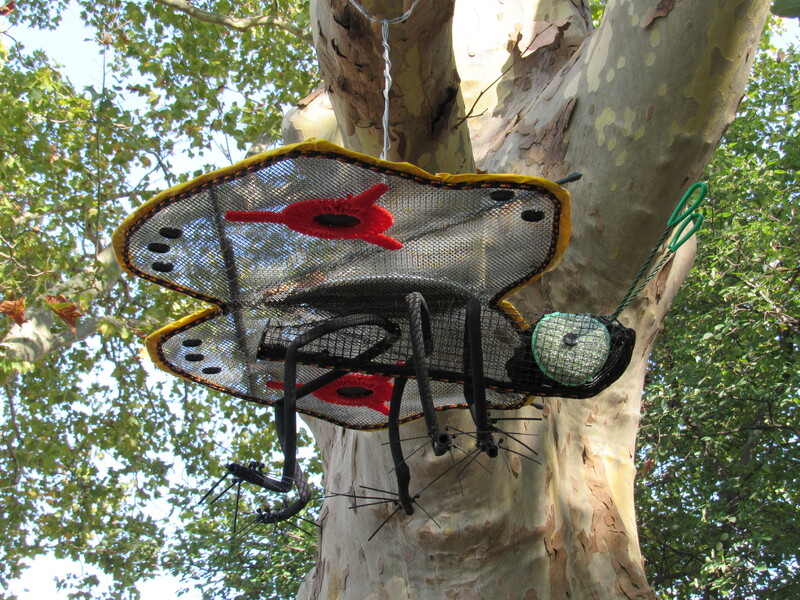 Mary Martire used metal, plastic, nylon rope and wire to construct these engaging bugs. Mary Matire is well known for her ceramics using clay to create useful pieces for dining and decorating. The nuances of color, shape and style continue to intrigue her. 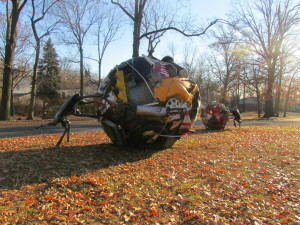 She teaches at the Art School at Old Church, in Demarest, NJ. 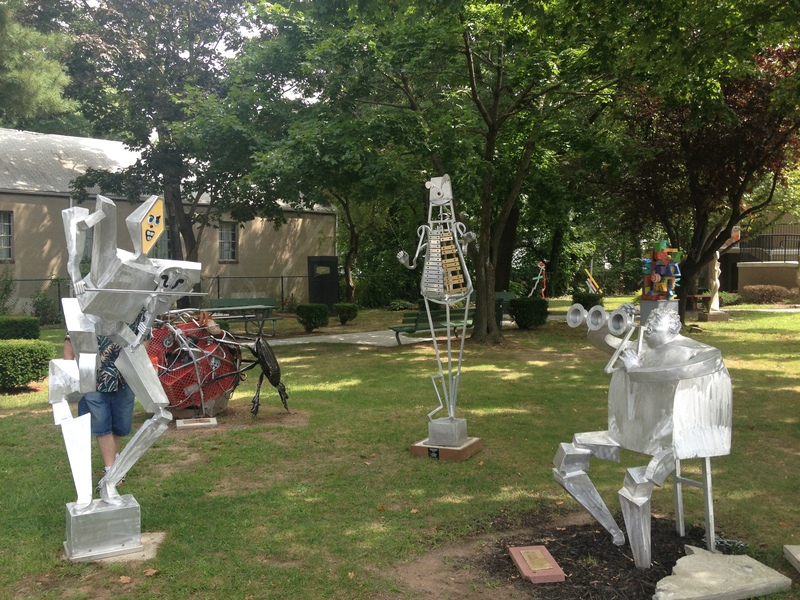 This encouraged her into new directions, such as the giant insect sculptures, which hang in Leonia, NJ. They evolved from teaching a children’s sculpture class called Bugs and Butterflies. The mixed media wall pieces which are a combination of ceramics and woven fabric, also got their genesis while teaching kids. 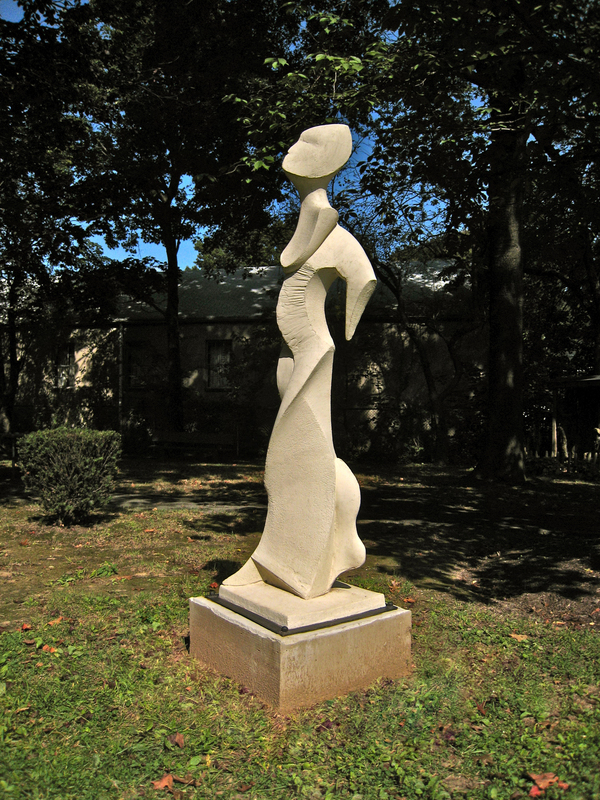 Mary Matire’s work has been in galleries and art shows throughout New Jersey. 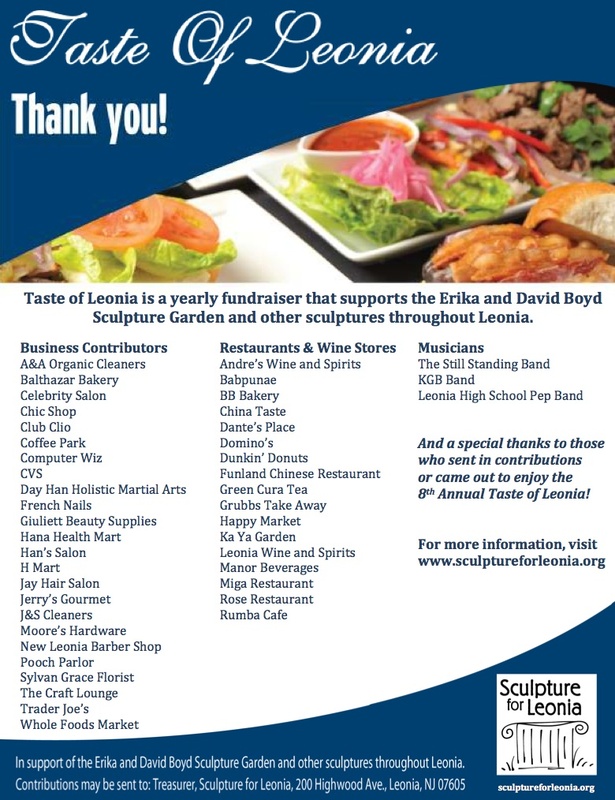 The taste of Leonia was a great success our best year yet! It seems like good wine we also get better over the years. We would like to thank everyone participating! 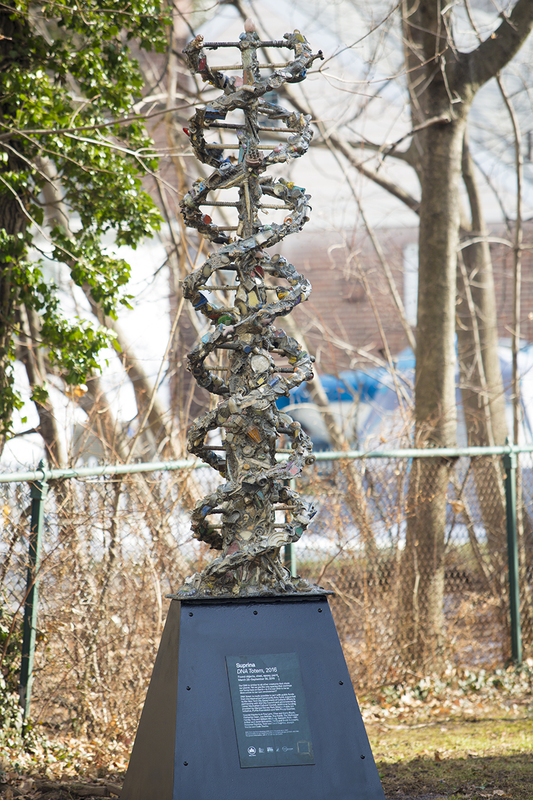 This sculpture was donated to the Town of Leonia to commemorate the life and contributions of Mr. John R. Stenken a 65-year resident and former Mayor of Leonia. 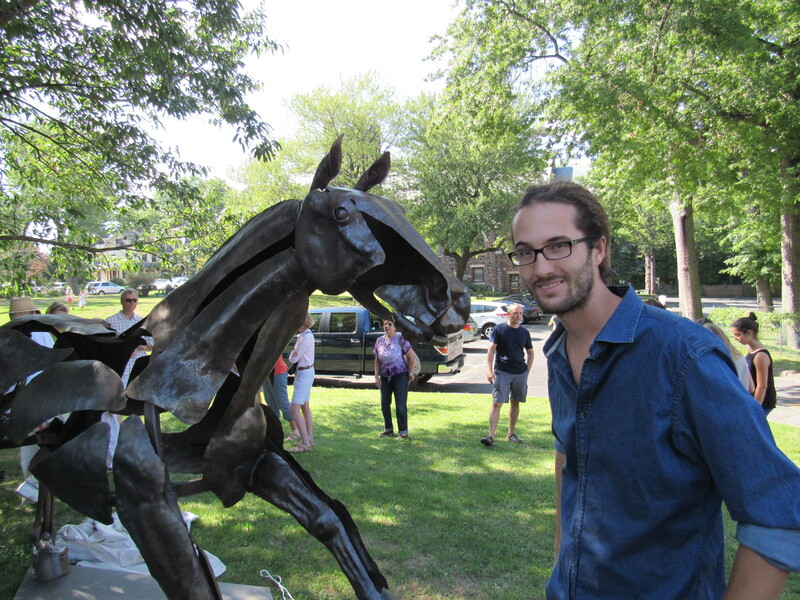 Horses have always been a great inspiration to Adrian Landon and have become an irreplaceable part of his life. After studying Industrial Design at the the Academy of Art in San Francisco, traveling and working out in the American West and learning the trade of violin making with his father. 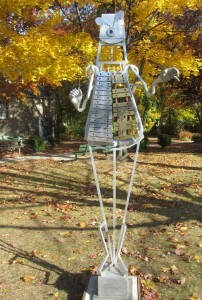 He studied metal sculpture at The Art Student League of New York. “It is all about the process, about shaping, forming, manipulating the element, putting my energy into it”. 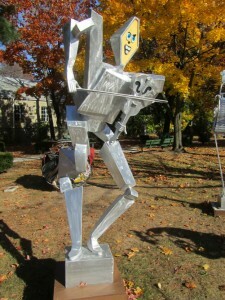 Steel is his main medium and he uses the anvil and hammer to work the steel. 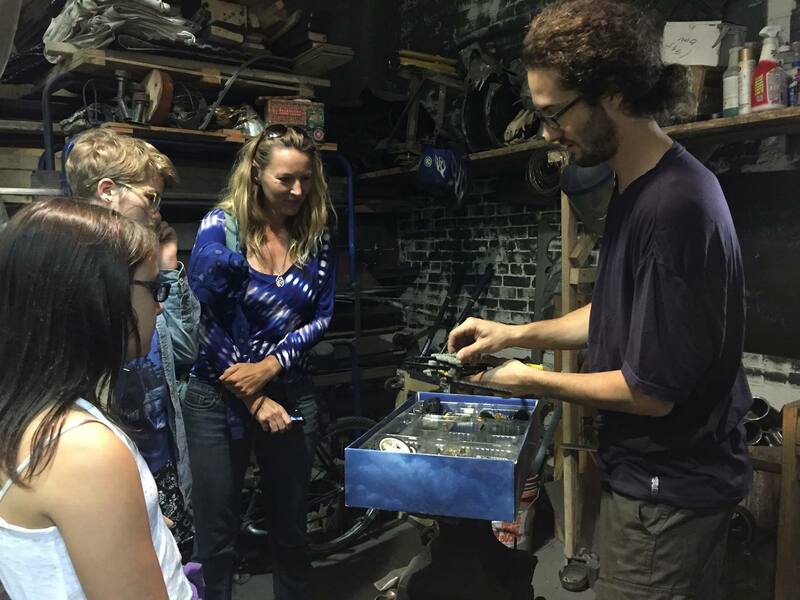 Adrian Landon’s metal shop is currently located in Gowanus, Brooklyn, New York. 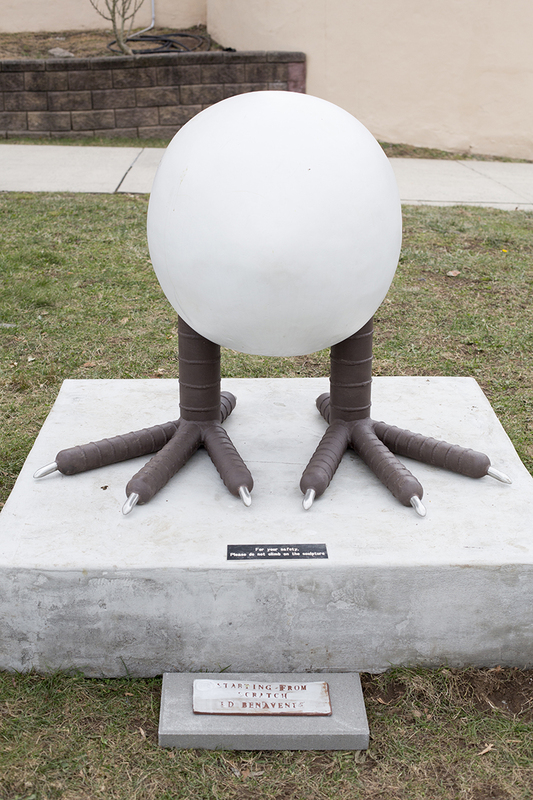 Previously displayed at the Station Park Rotunda. These Dung Beetles where created to highlight the importance of recycling.